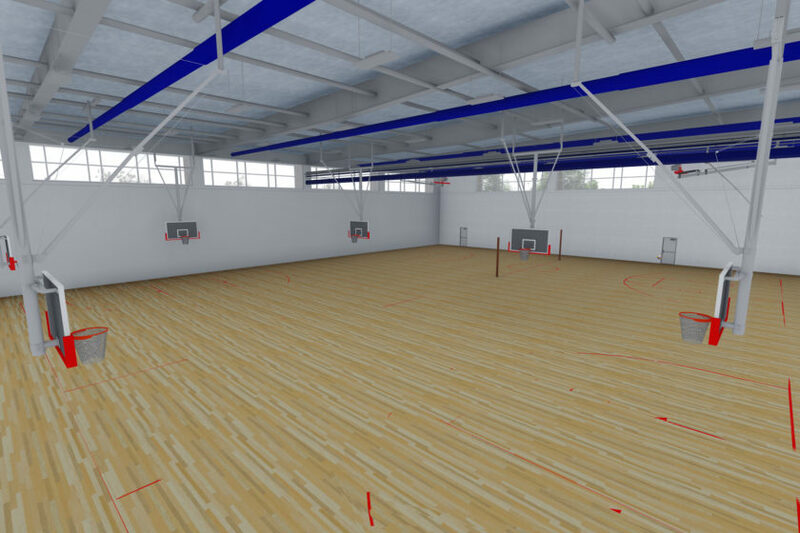 Renderings courtesy of RGM Associates Inc. Originally constructed in 1976, this facility includes a 13,500 seat arena, a 1,000 seat natatorium with swimming and diving pools and a 5,000 seat indoor track. 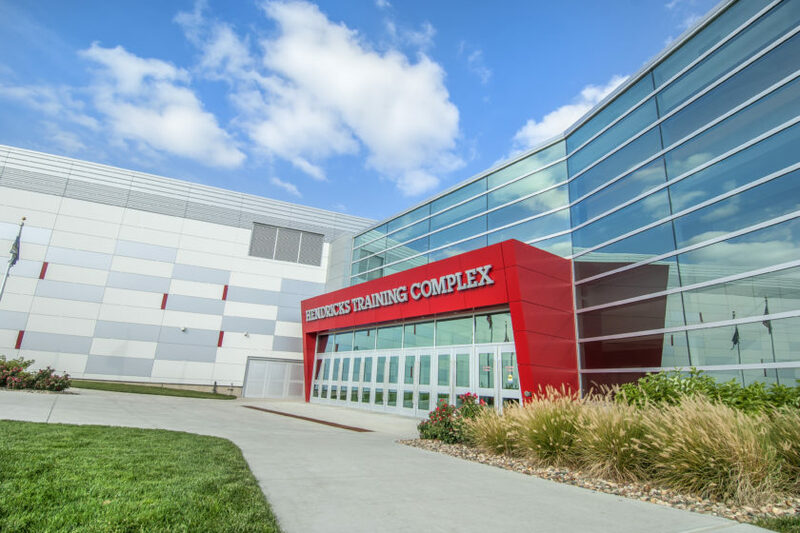 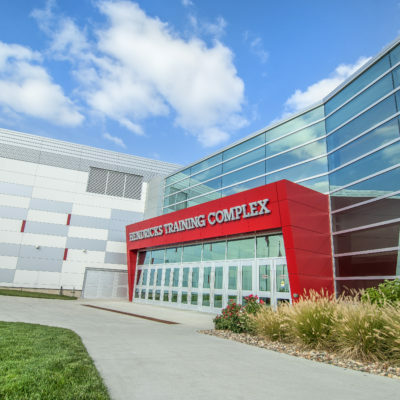 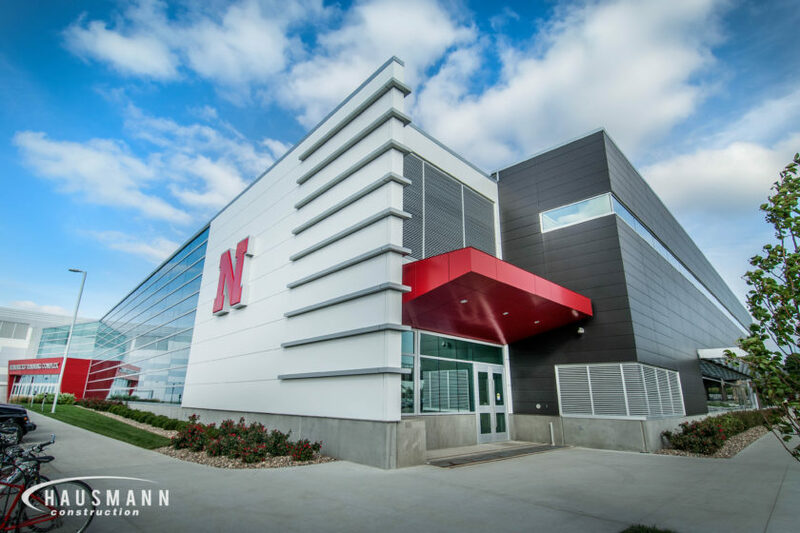 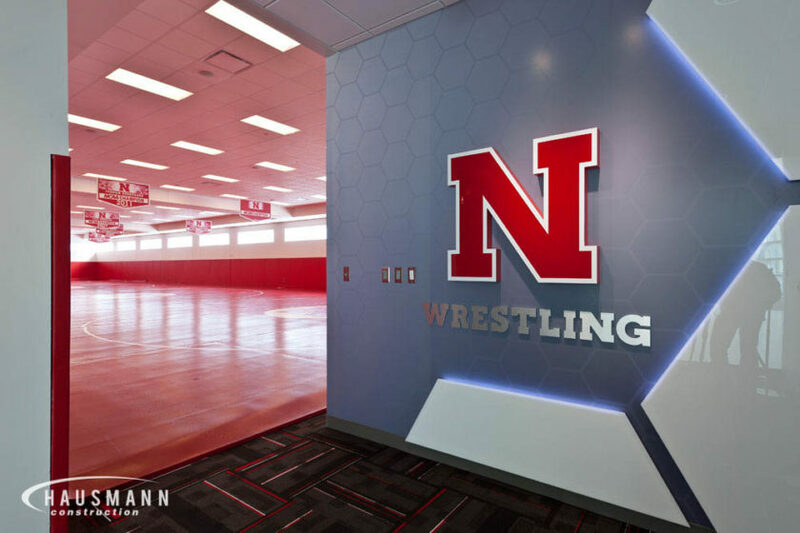 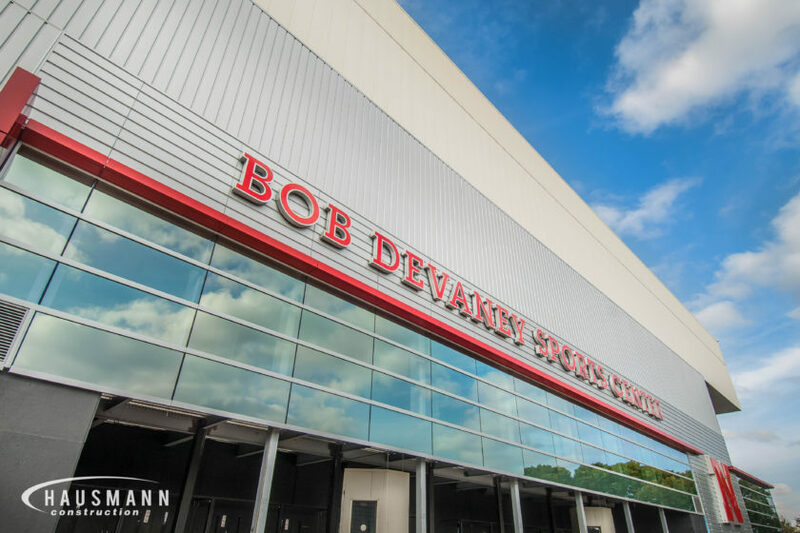 In addition to competition venues, Devaney provides a practice gym for wrestling, athletic medicine, locker rooms, coaches’ offices and a strength training complex. 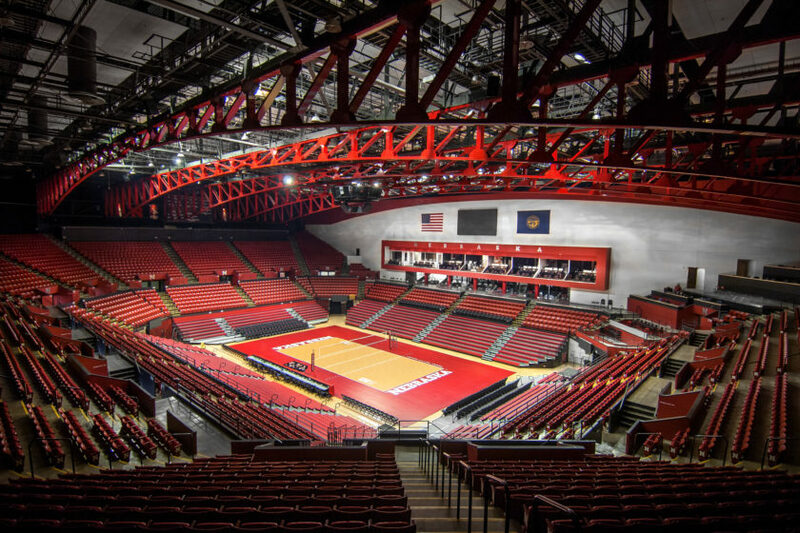 The renovation to the Bob Devaney Sports Center has transformed the facility into a premium volleyball arena for the University of Nebraska Lincoln. 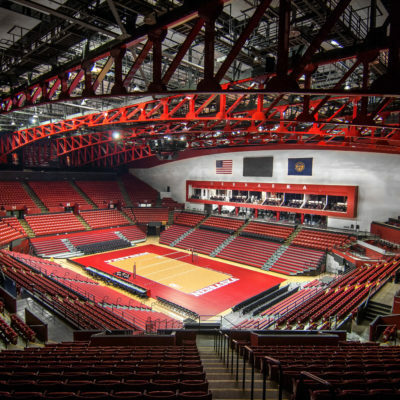 The Devaney arena is a mix of new and old. 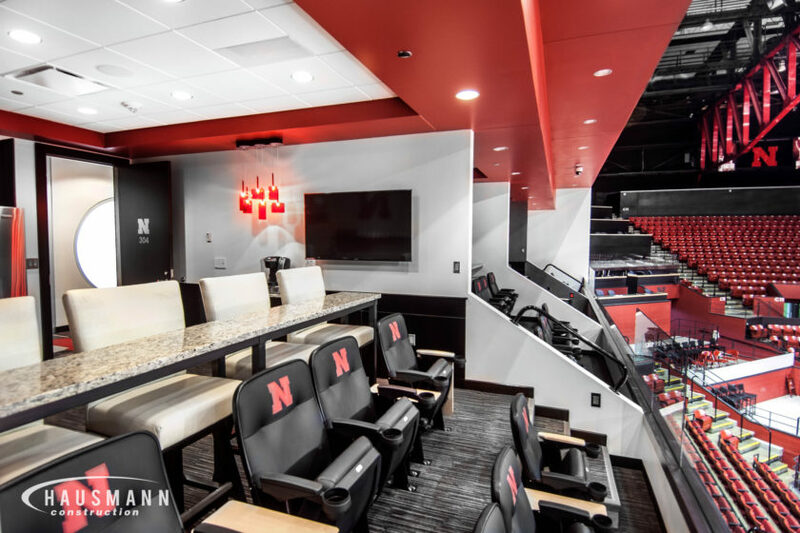 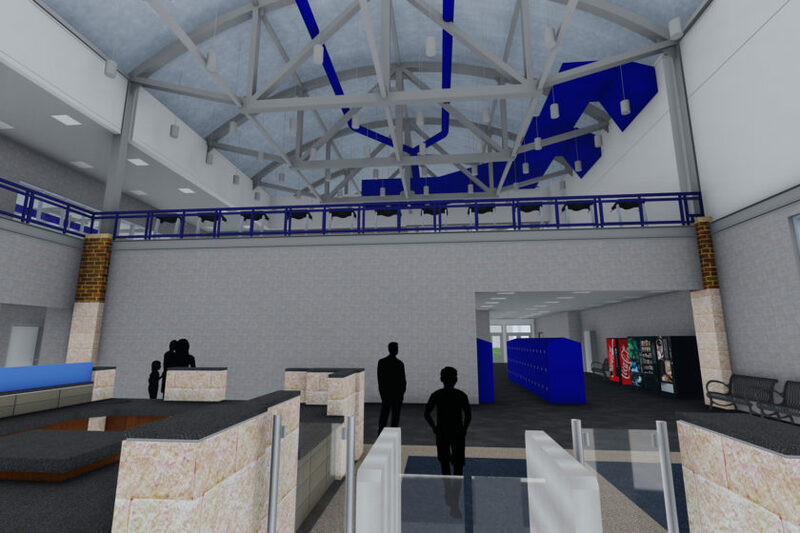 Premium hospitality suites, coaches’ offices, locker rooms, VIP areas, remodeled concession areas, new features to the brilliantly colored court and architectural trusses help to create the intimacy that Nebraska volleyball once enjoyed at the Coliseum. 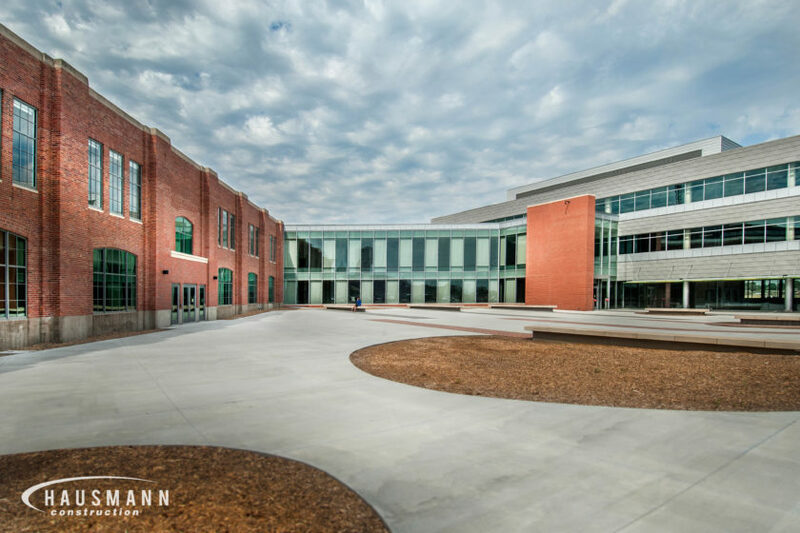 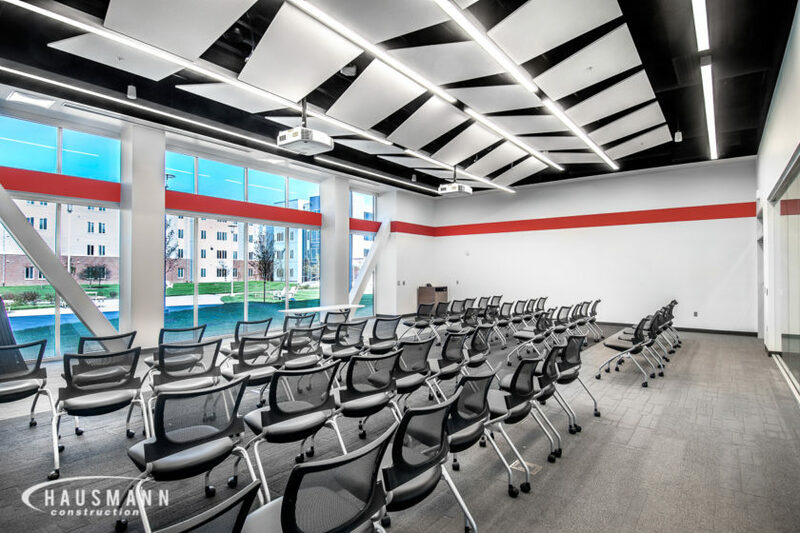 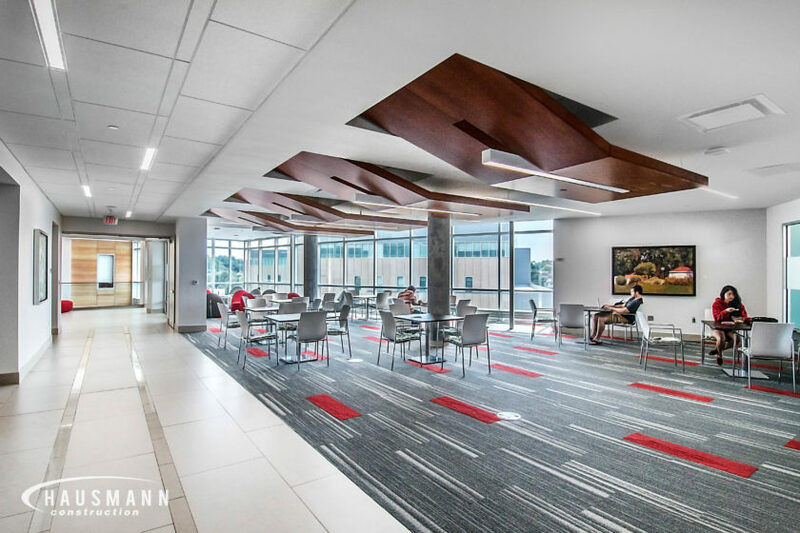 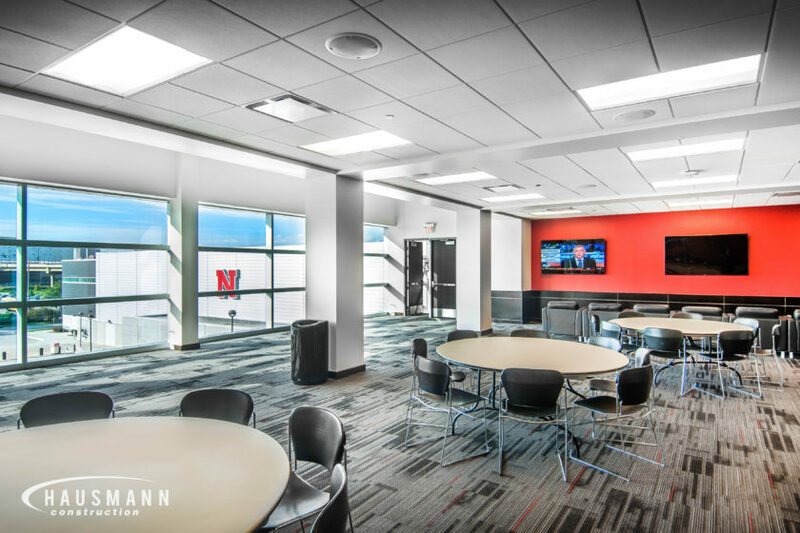 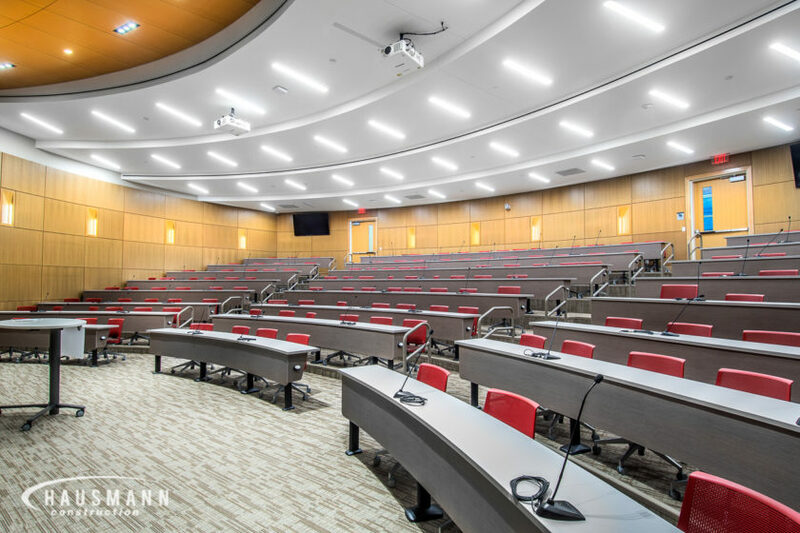 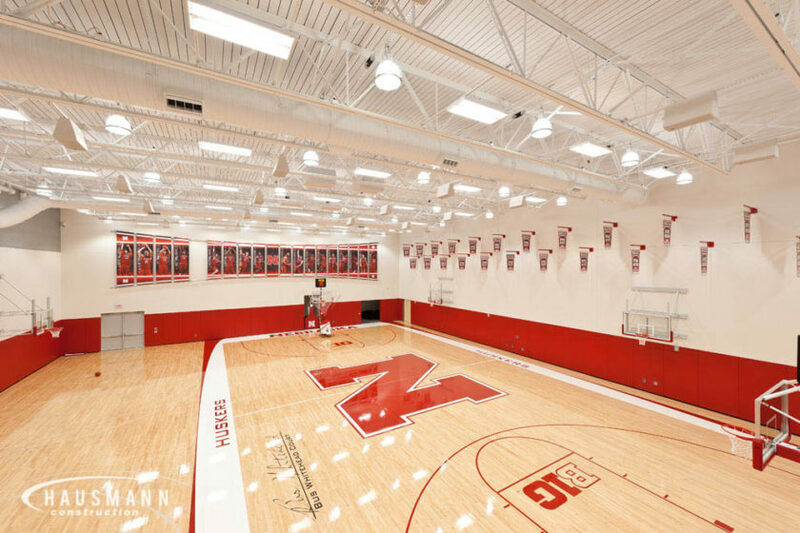 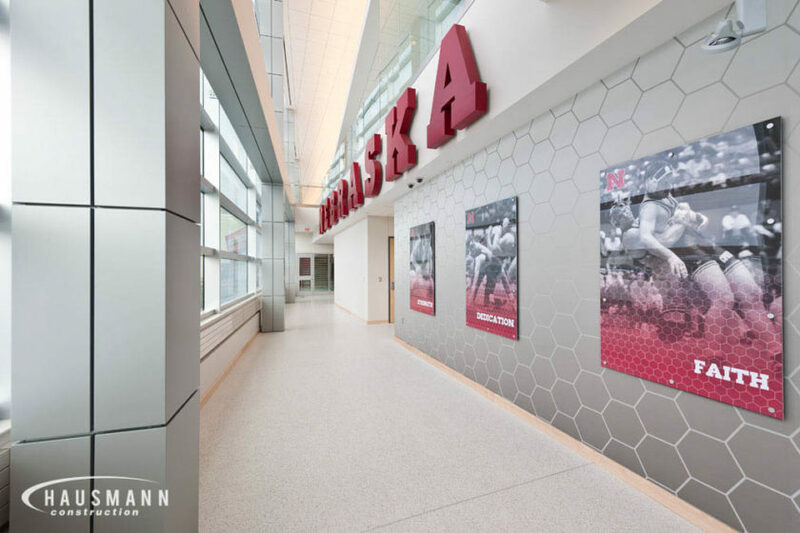 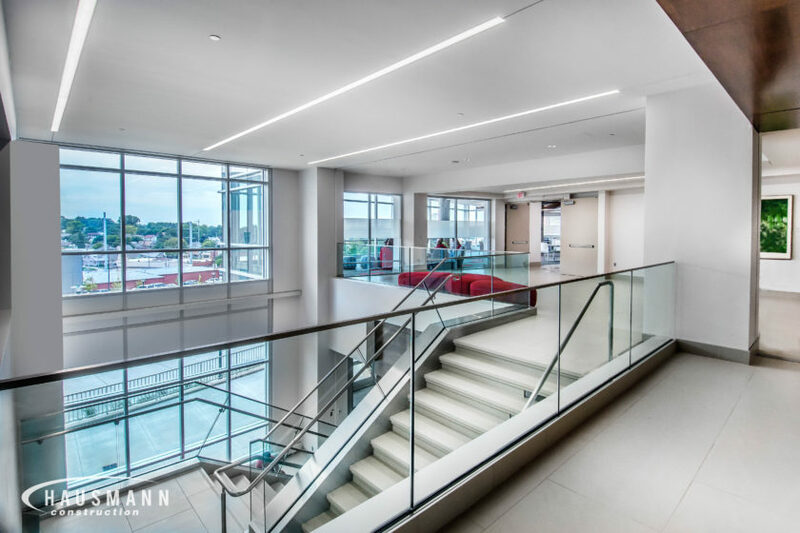 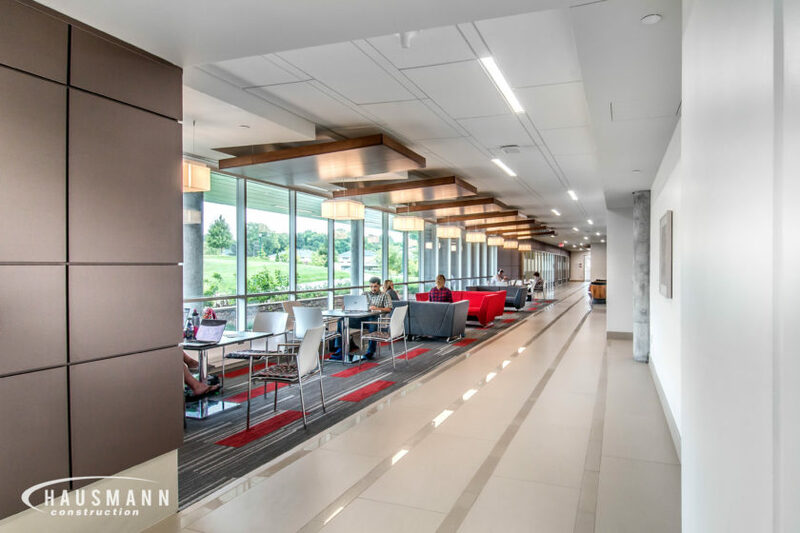 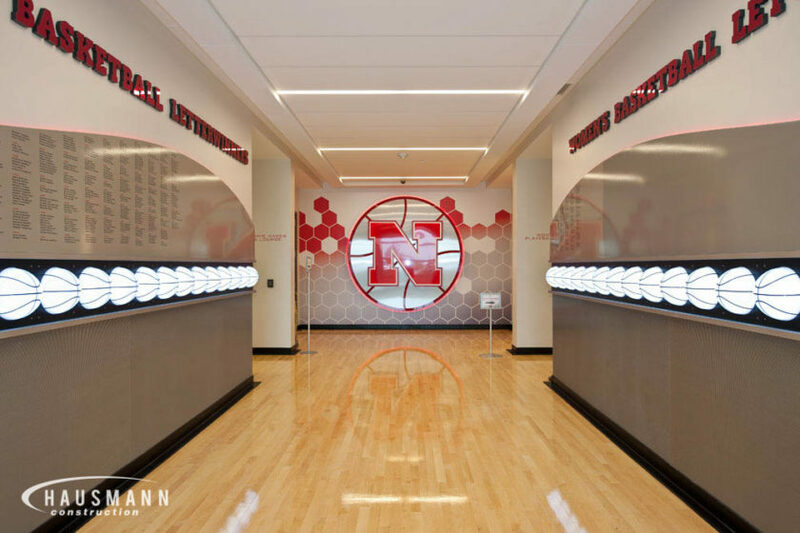 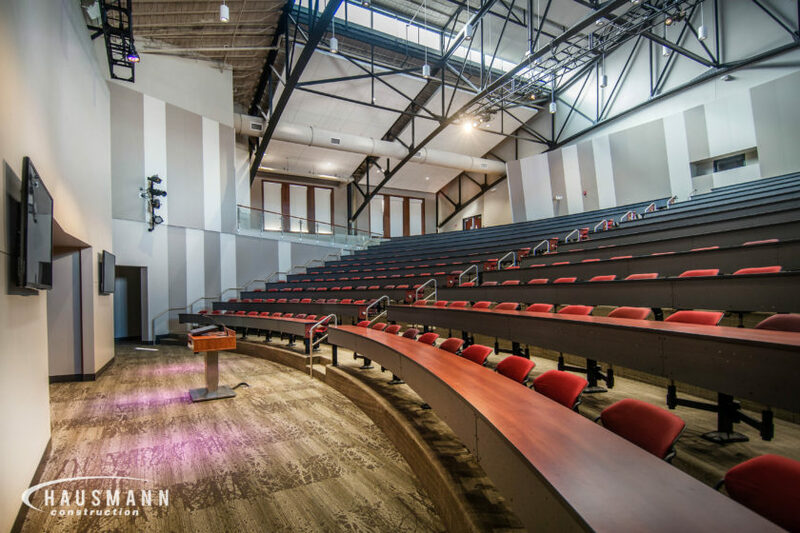 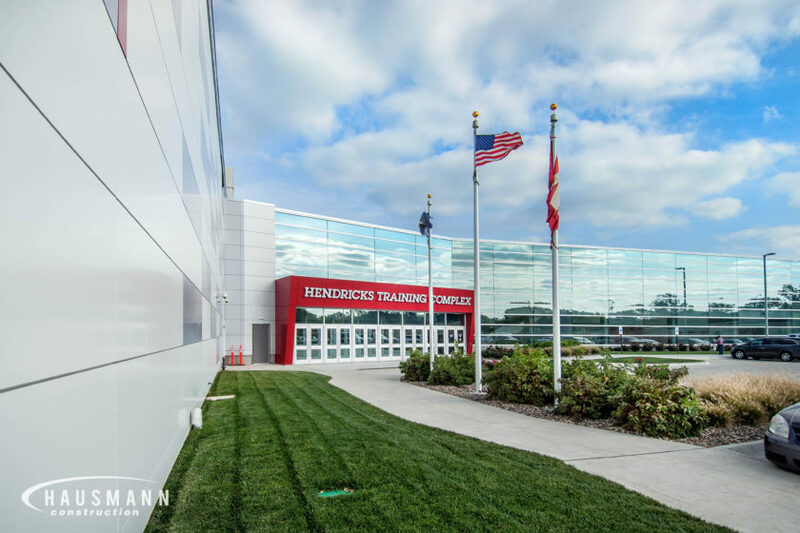 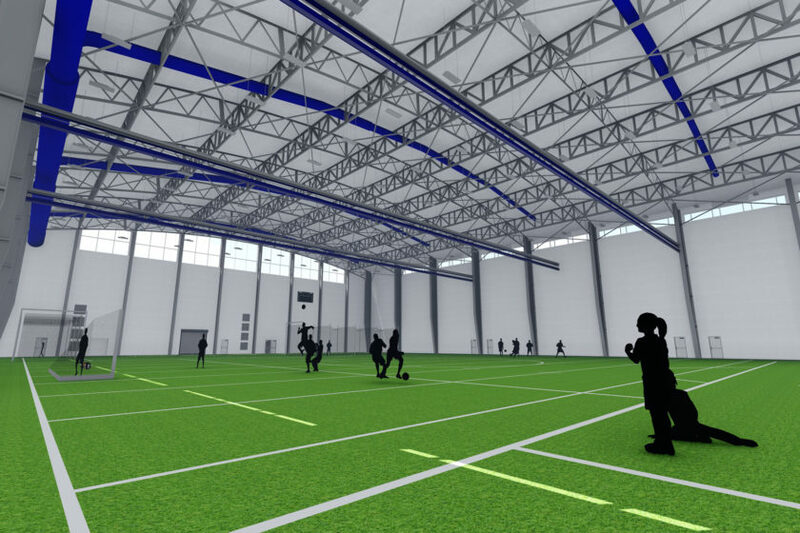 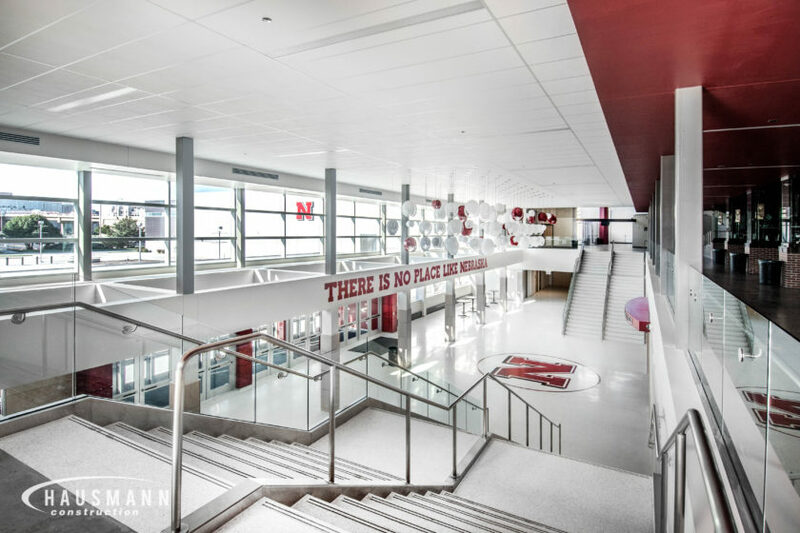 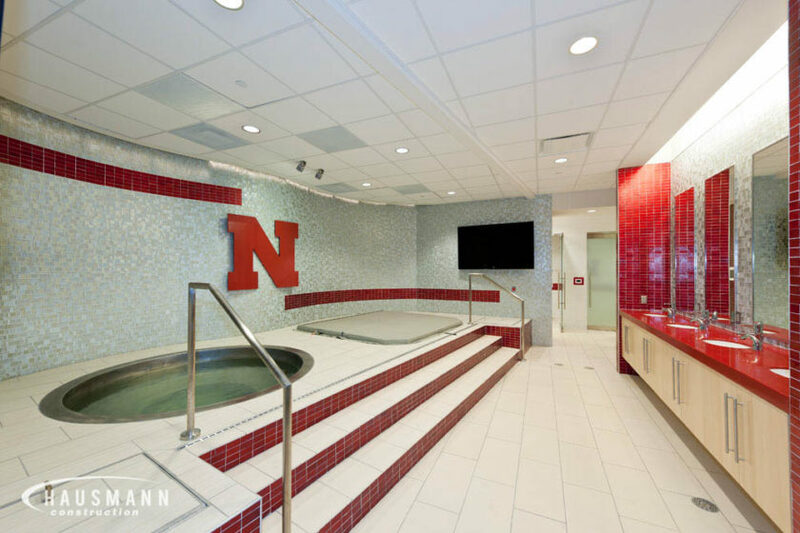 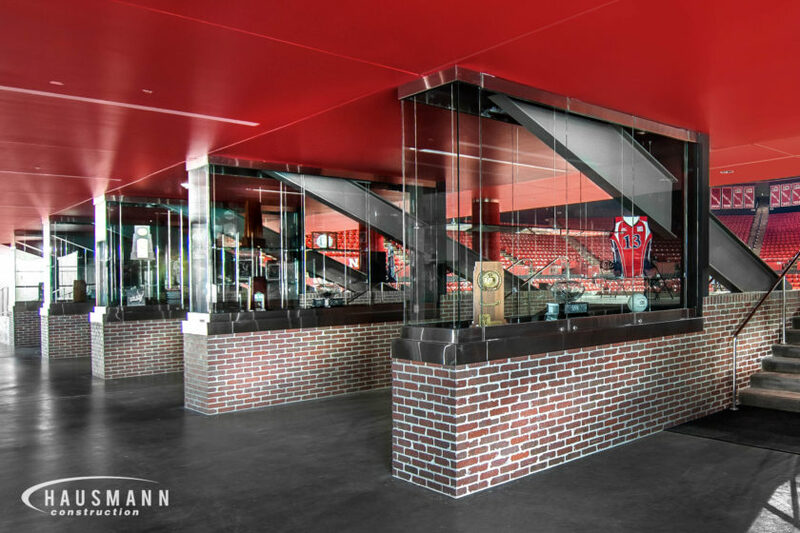 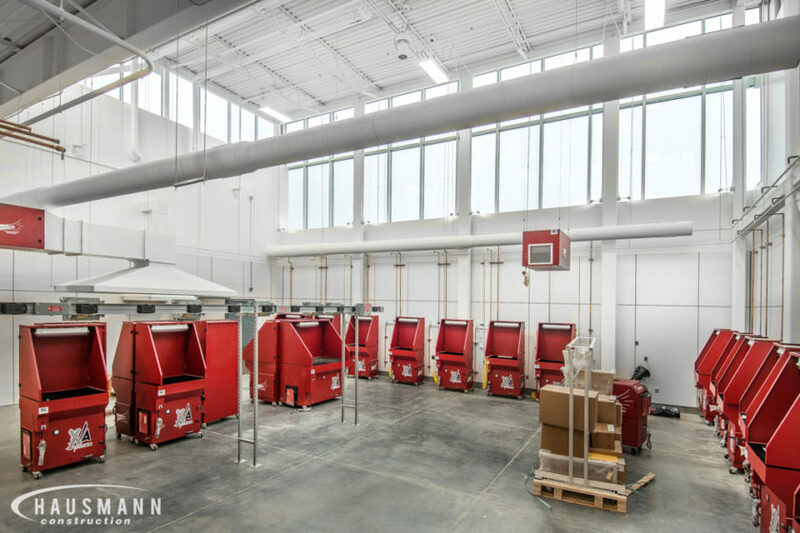 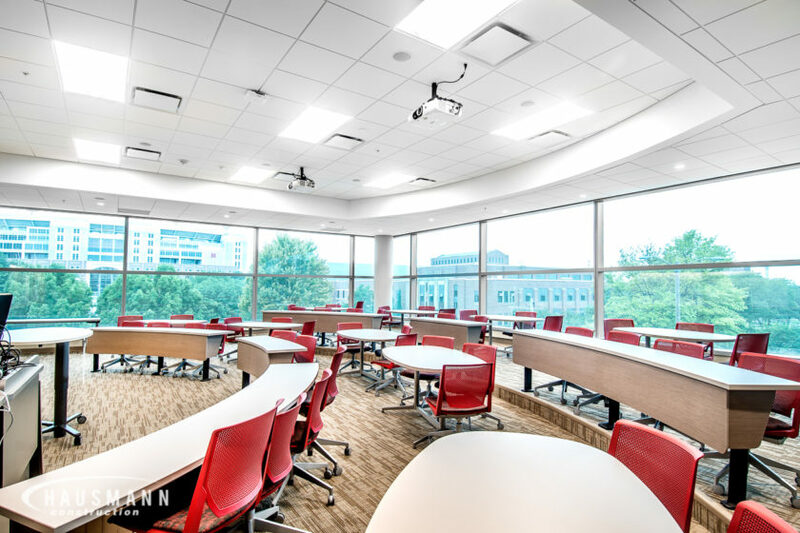 This 64,000 square foot project was completed for the UNL Athletic Department in Lincoln, Nebraska. 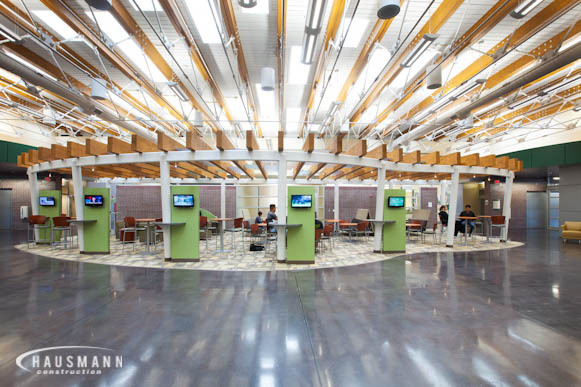 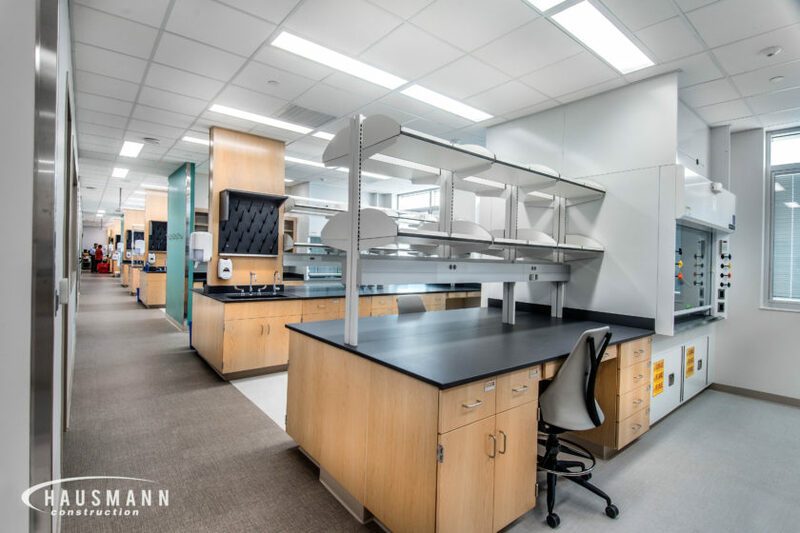 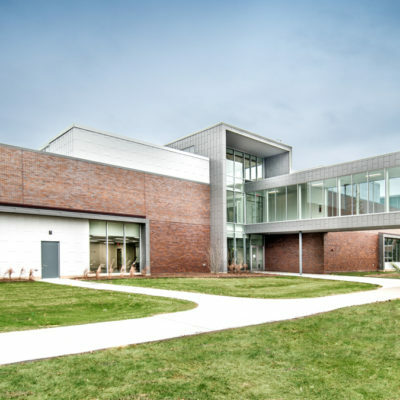 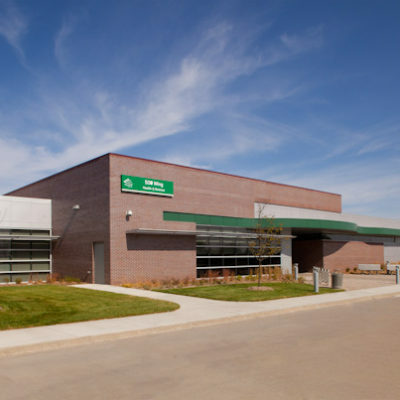 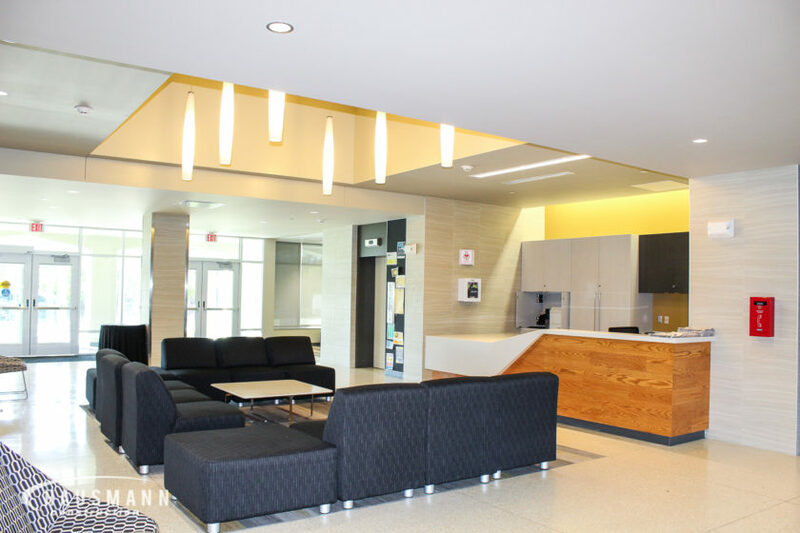 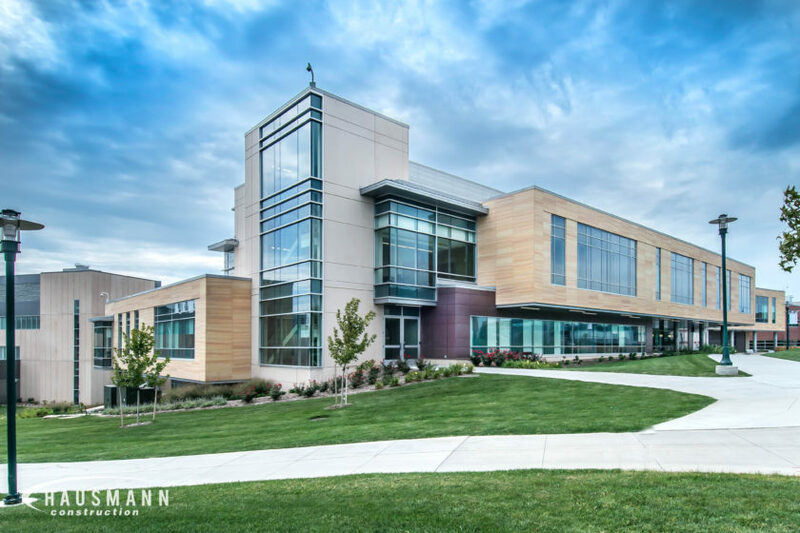 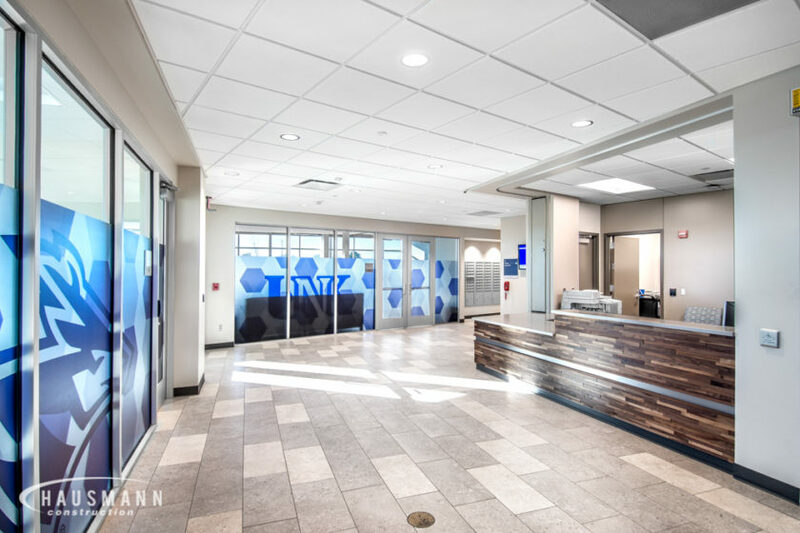 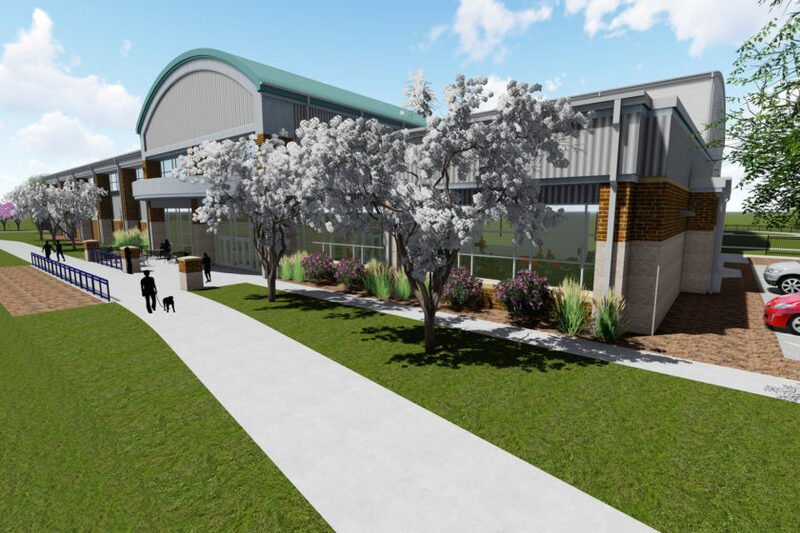 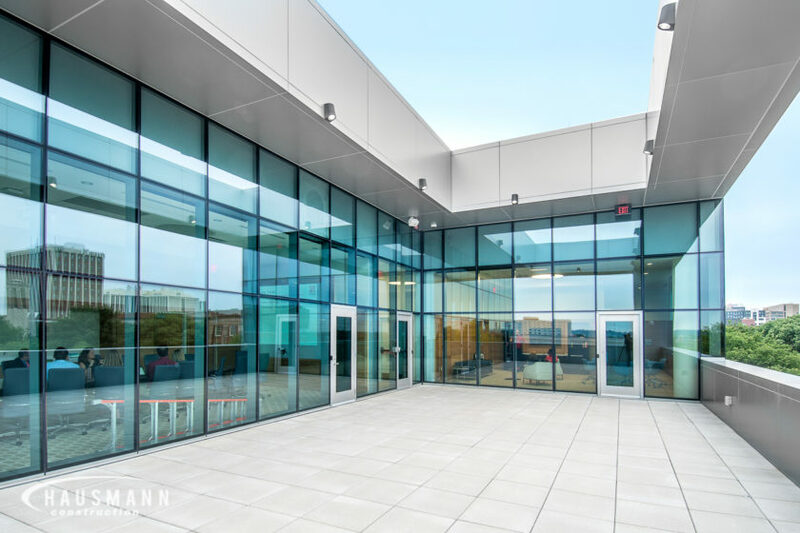 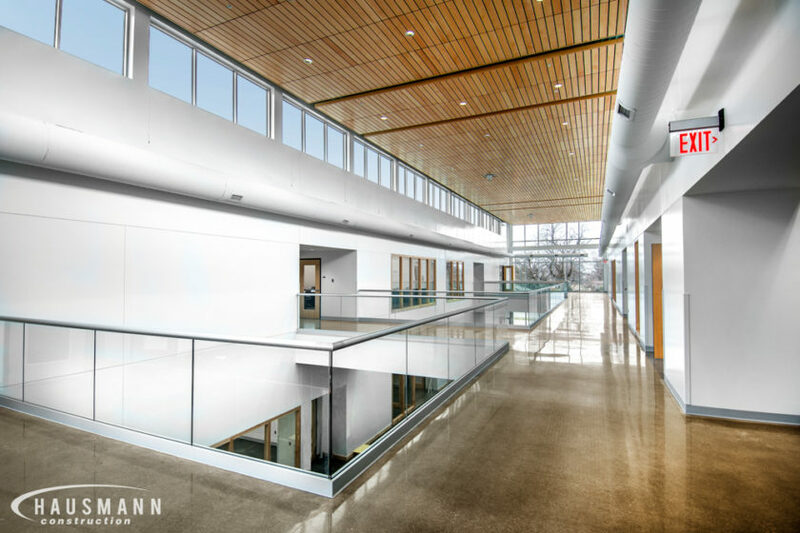 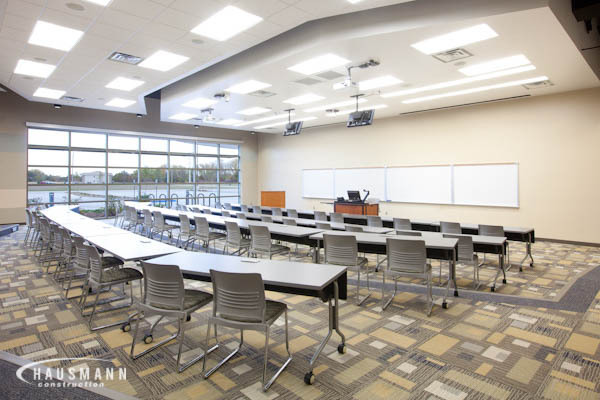 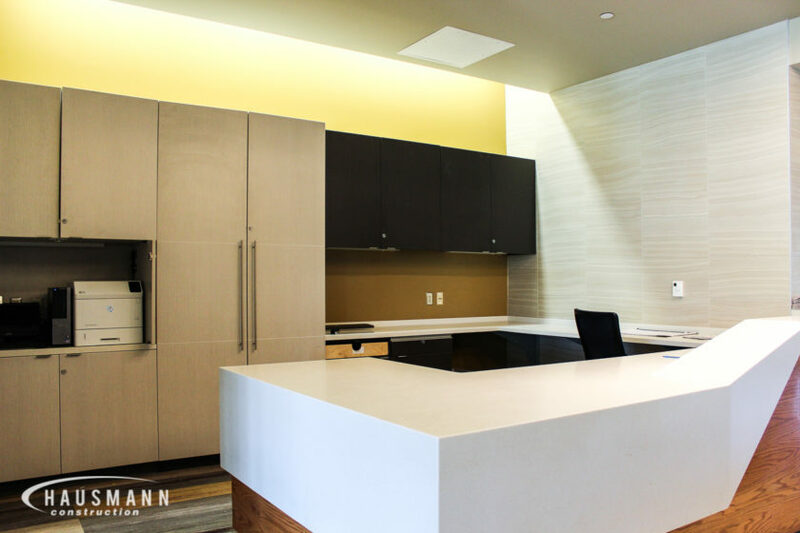 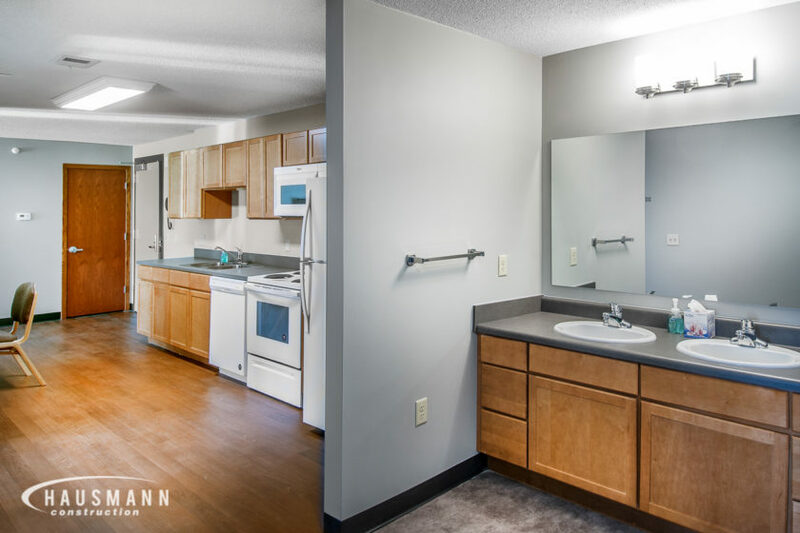 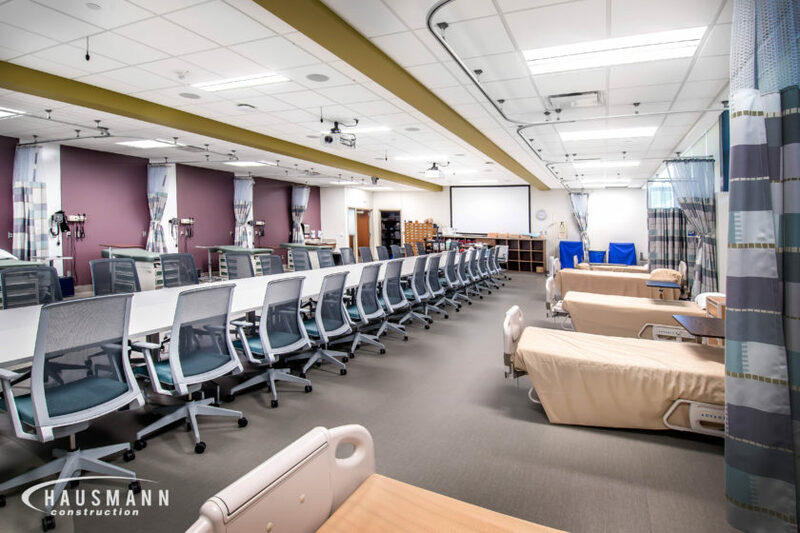 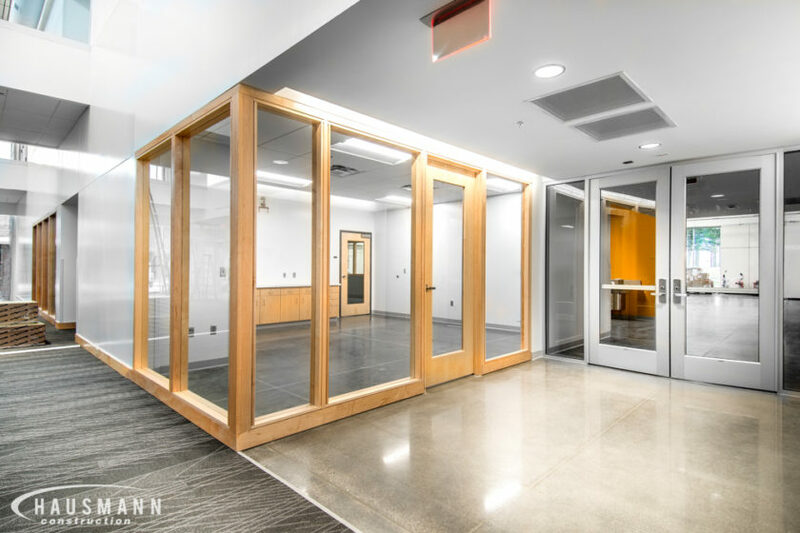 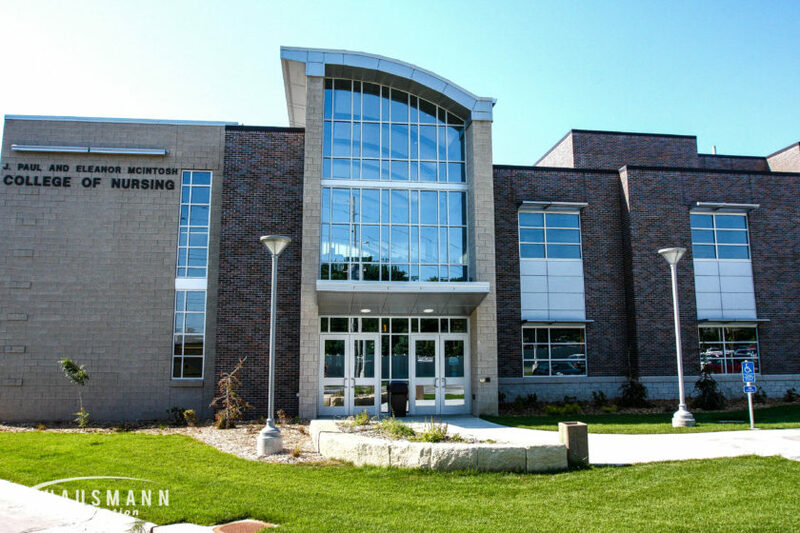 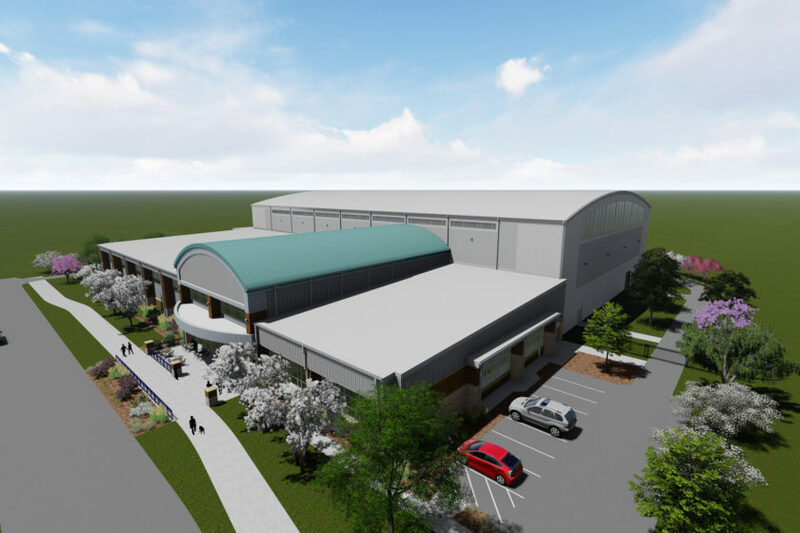 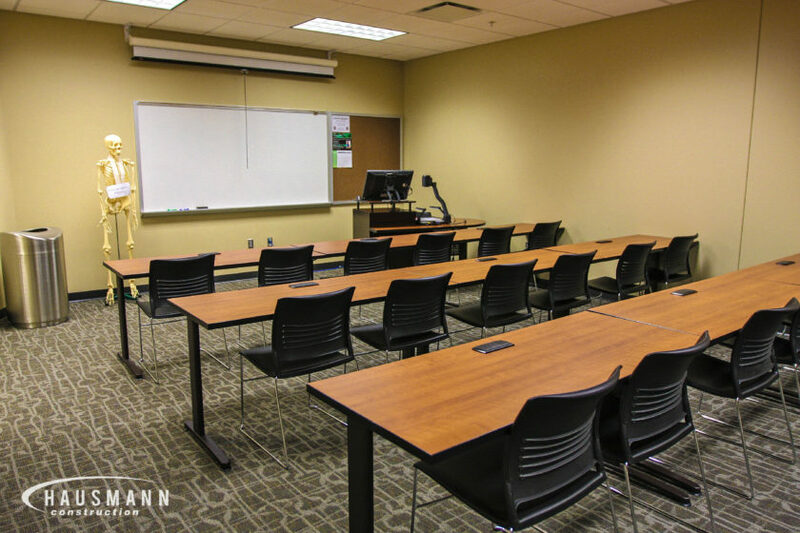 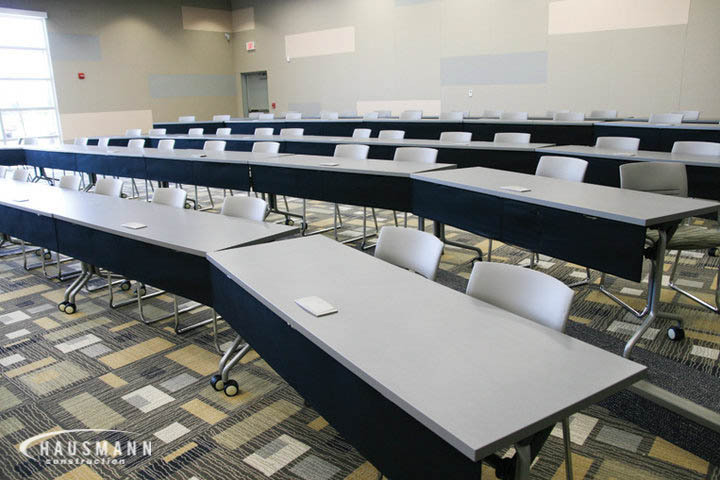 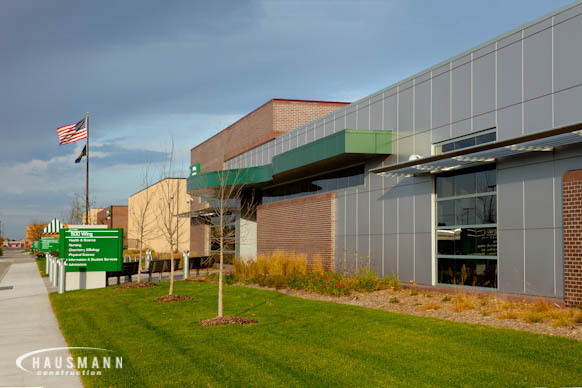 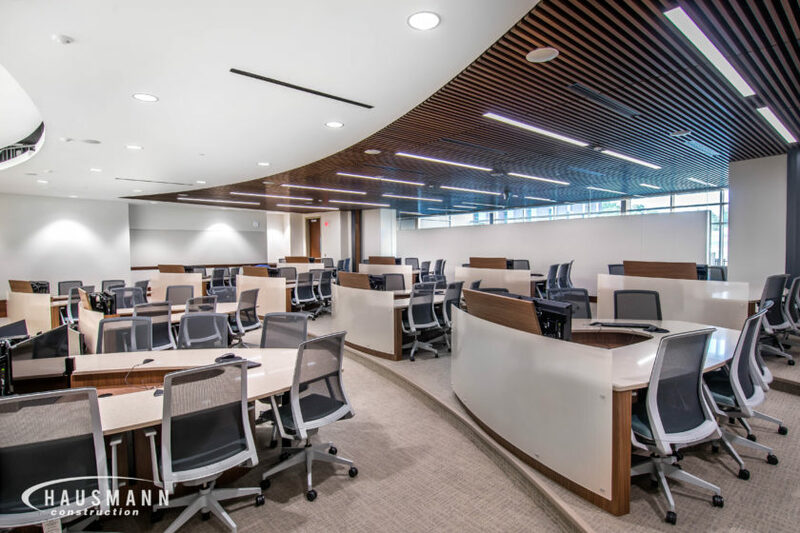 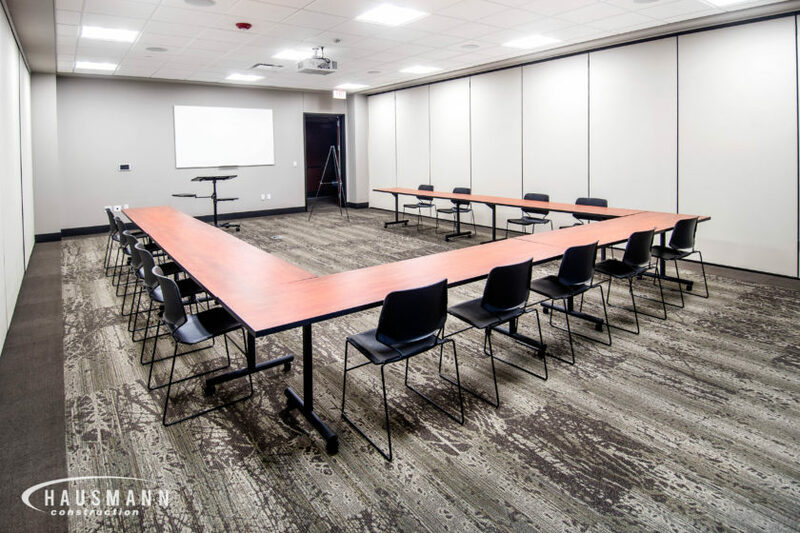 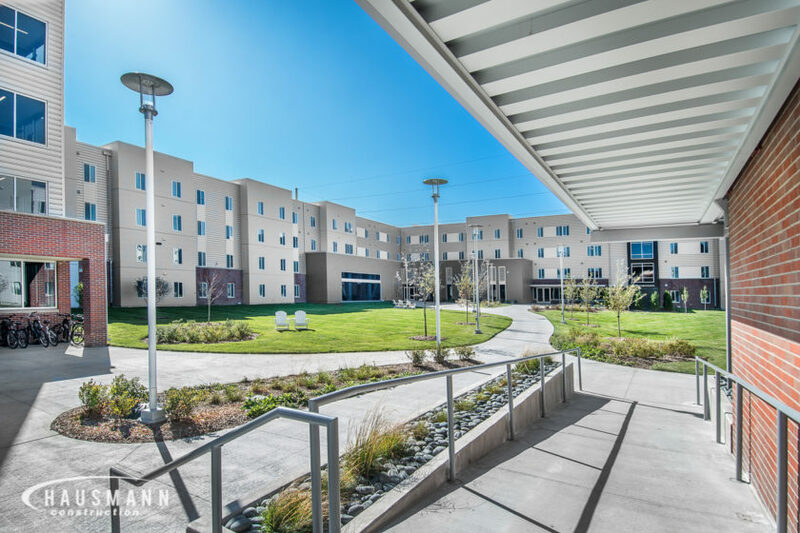 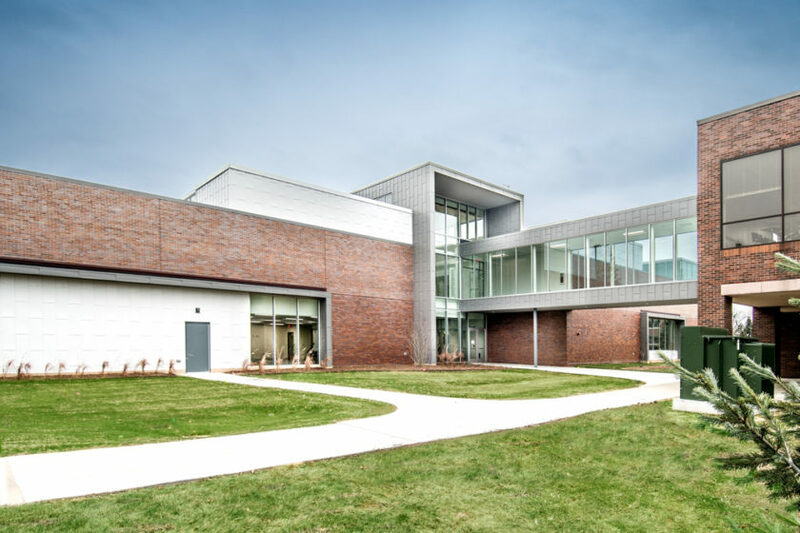 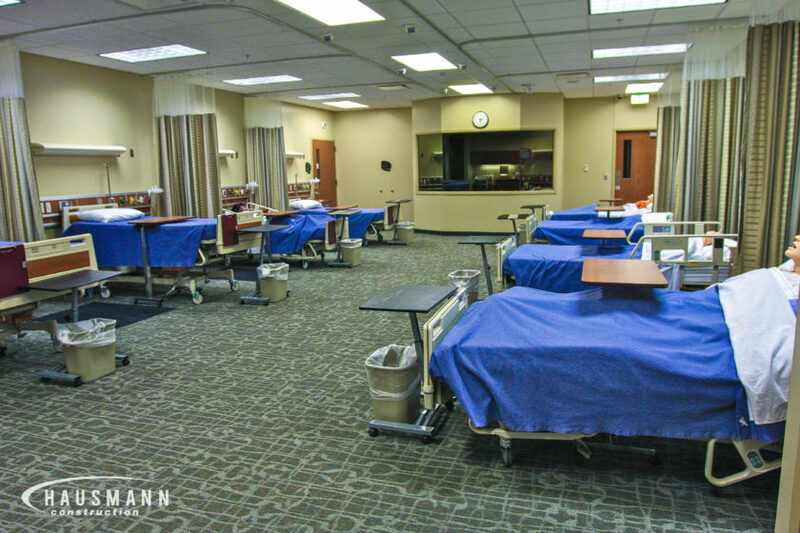 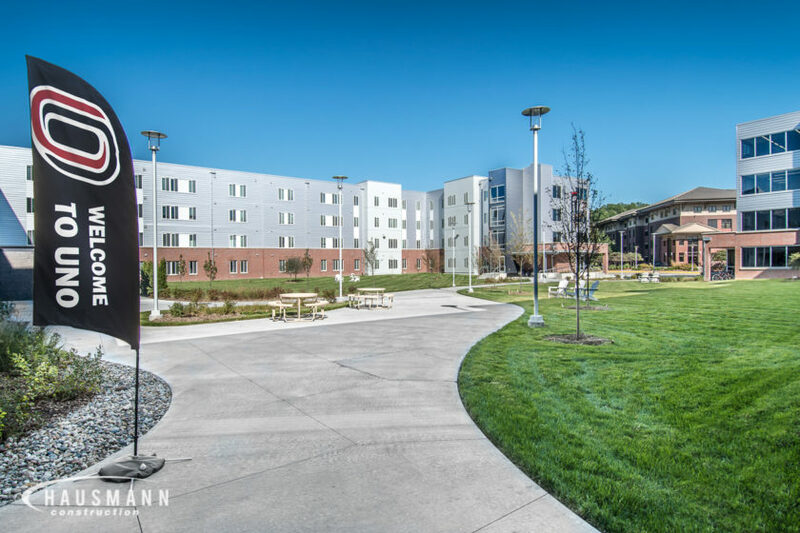 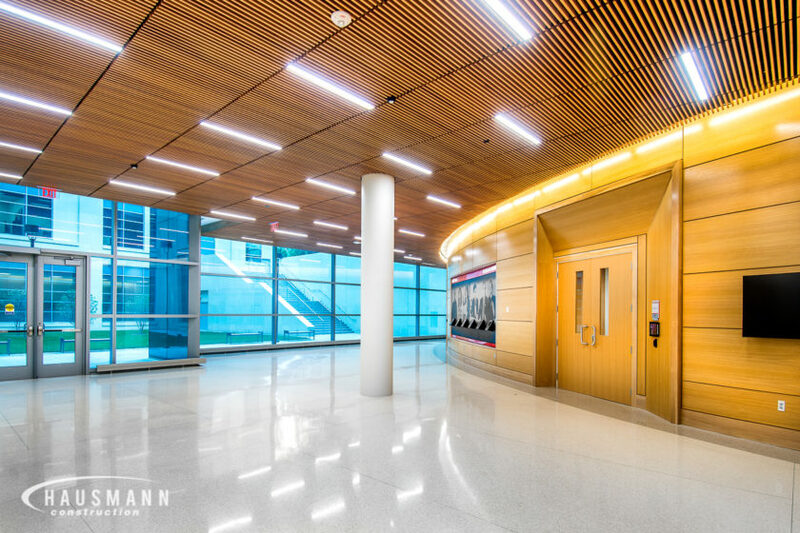 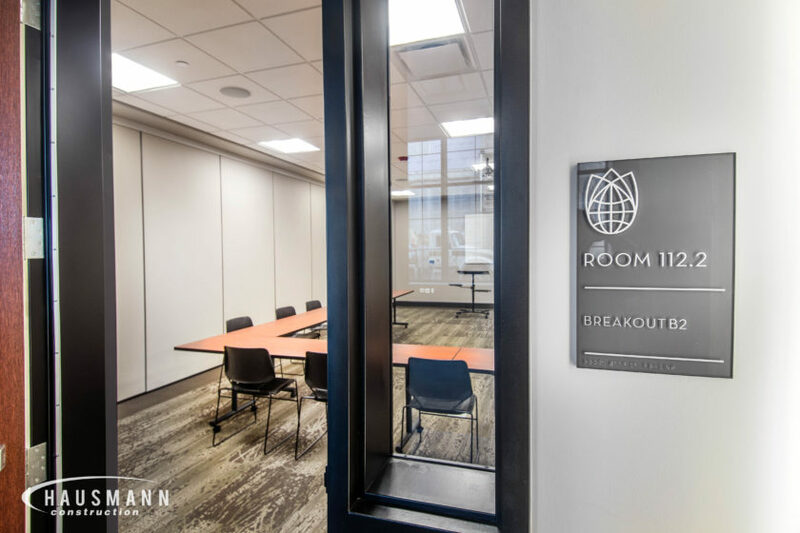 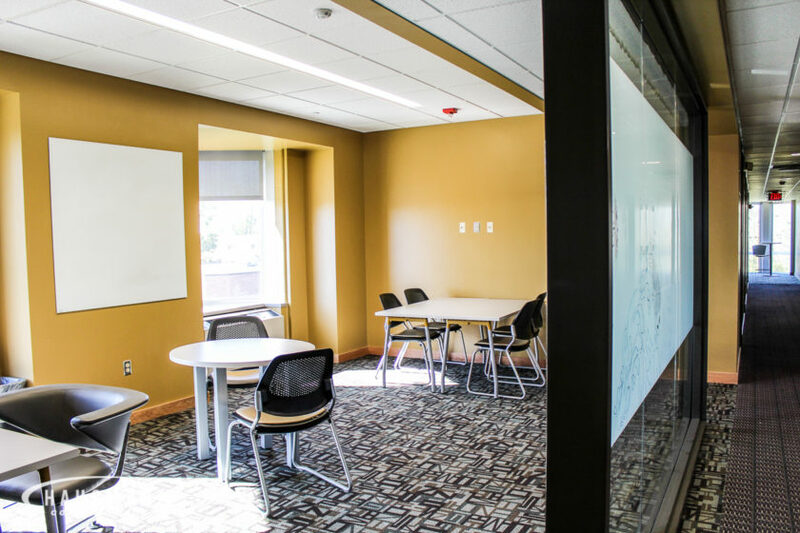 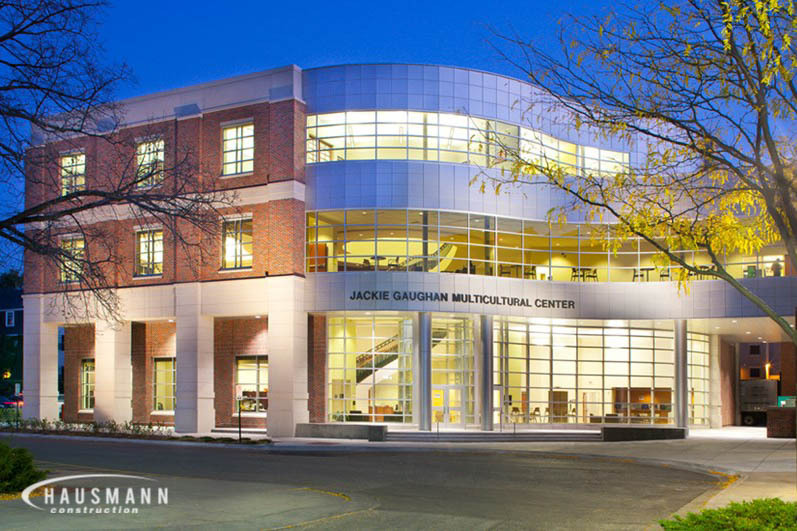 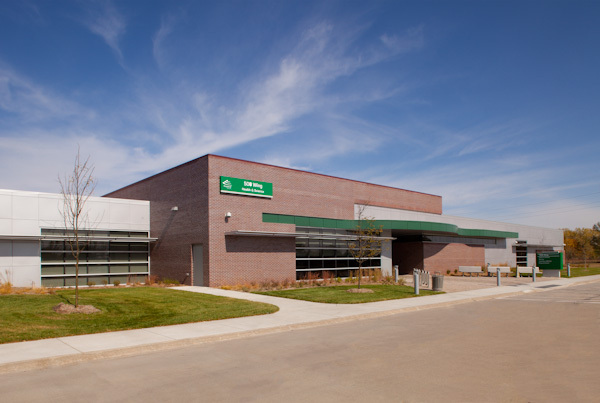 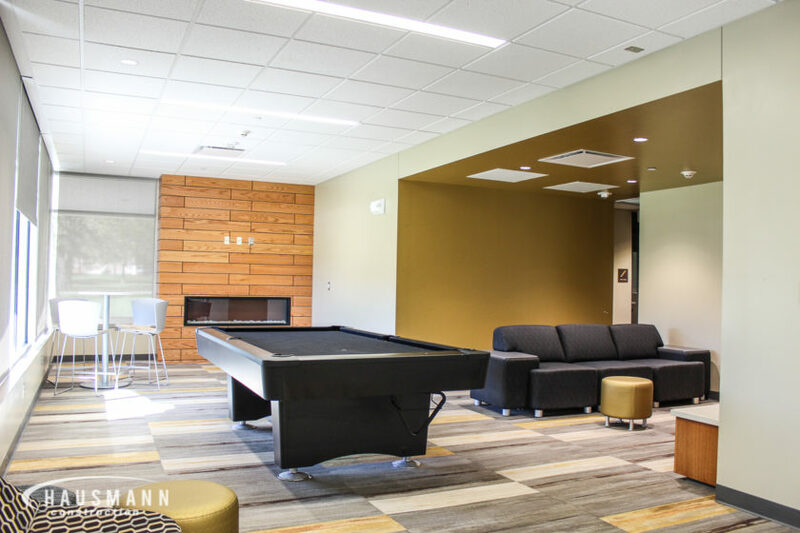 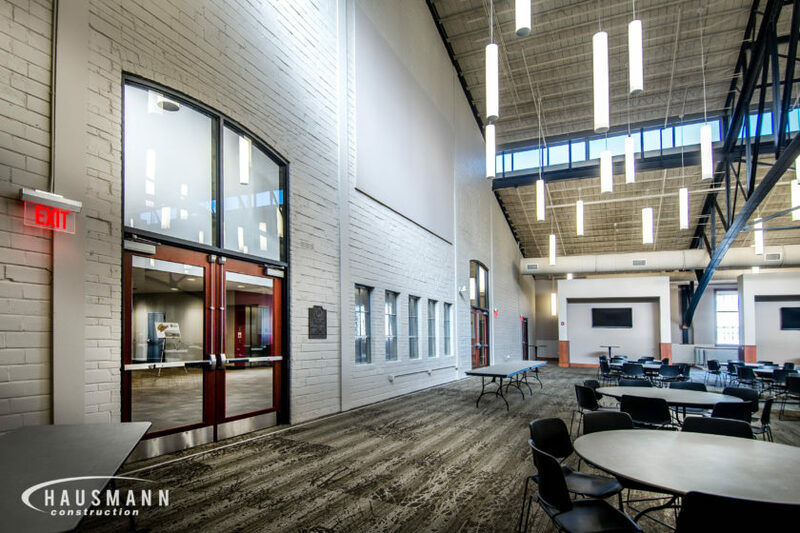 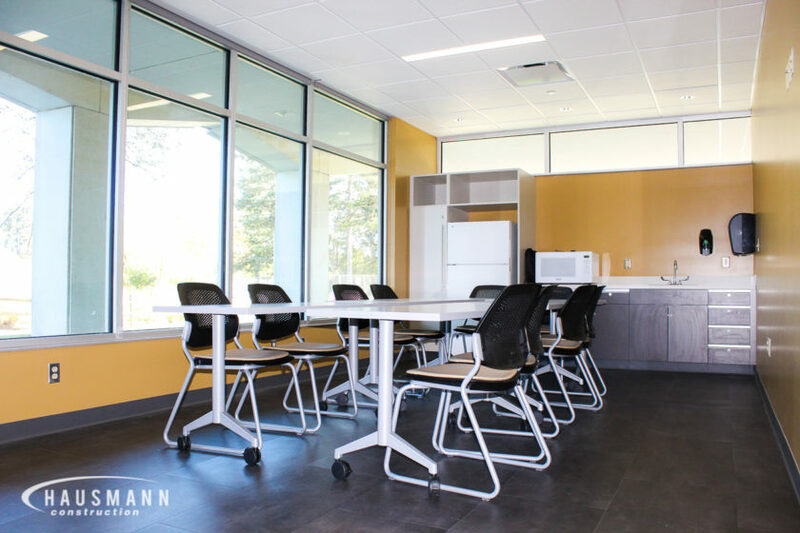 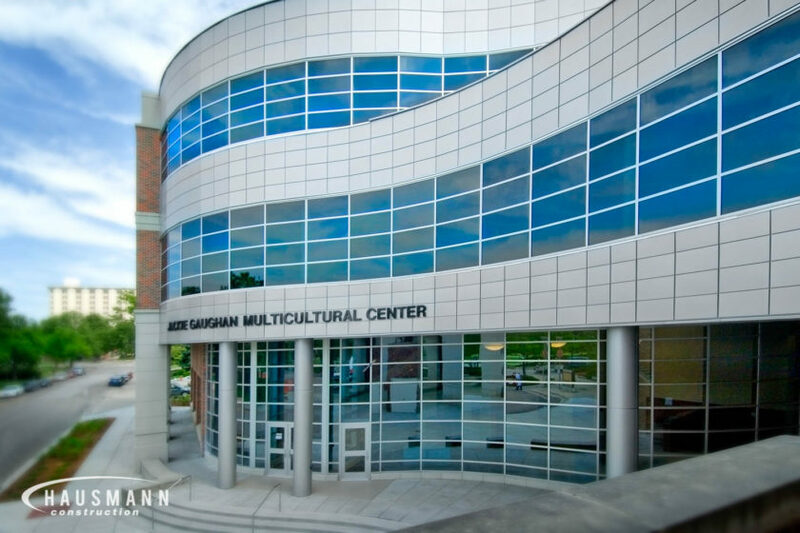 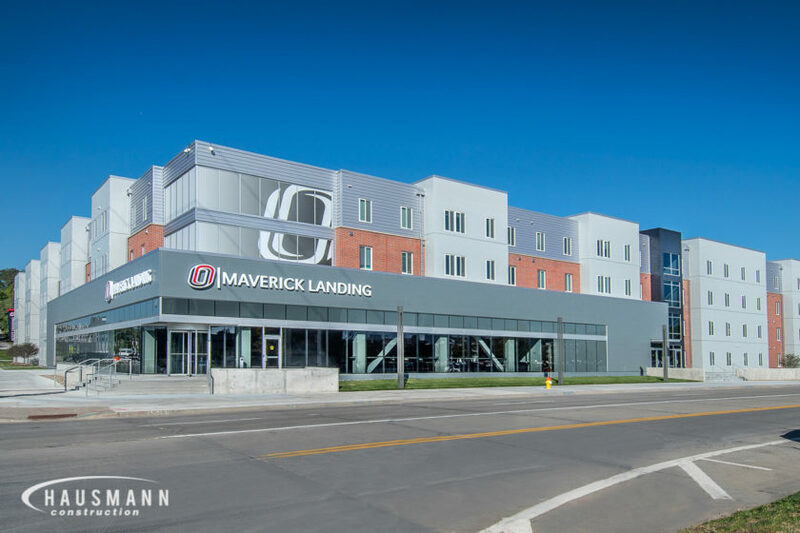 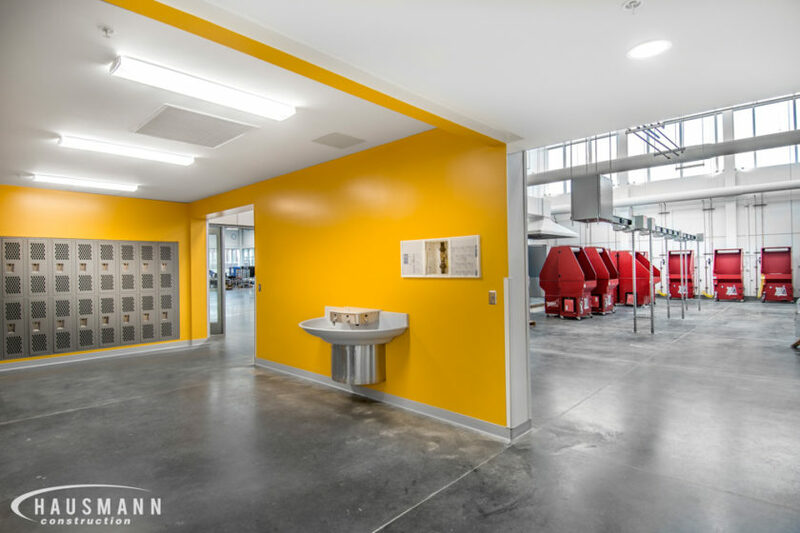 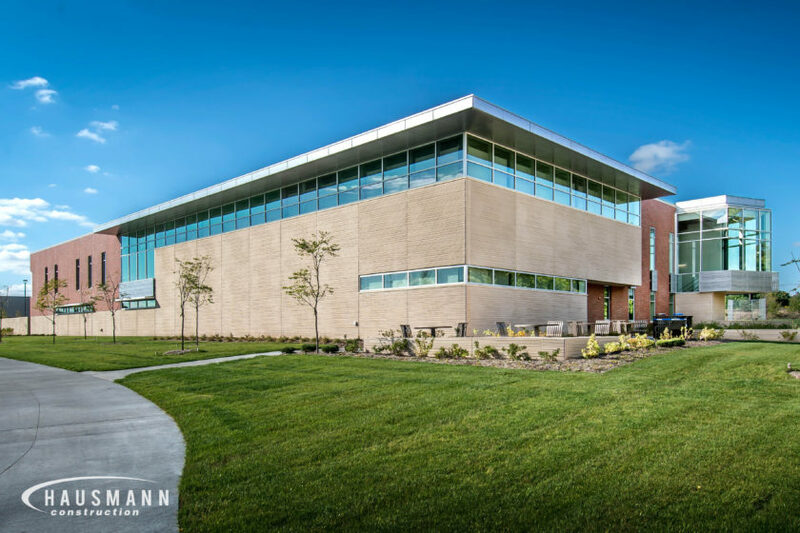 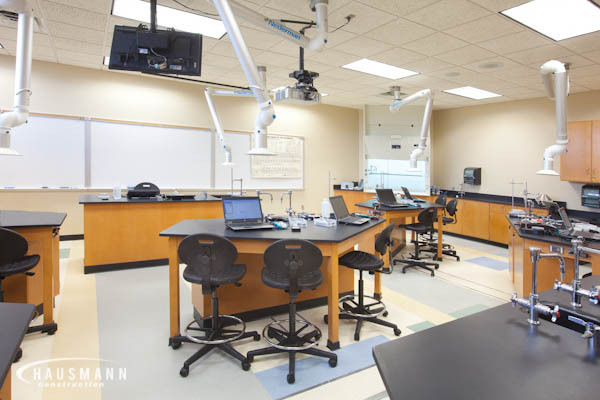 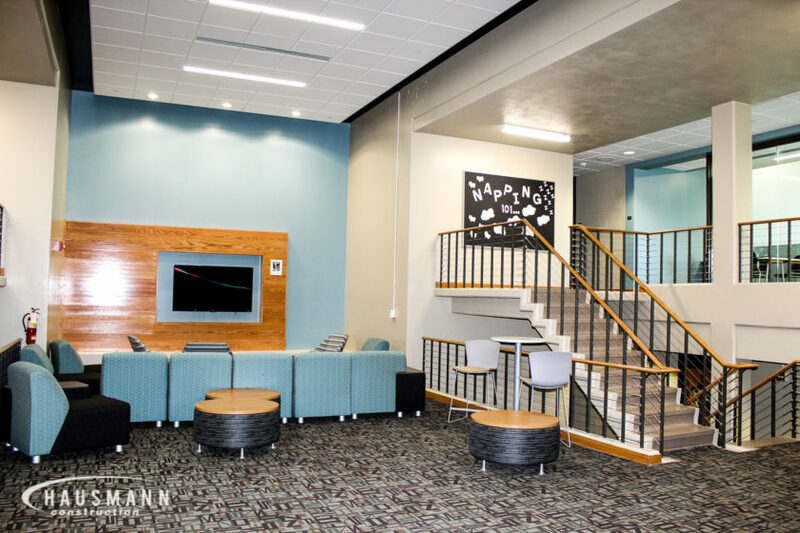 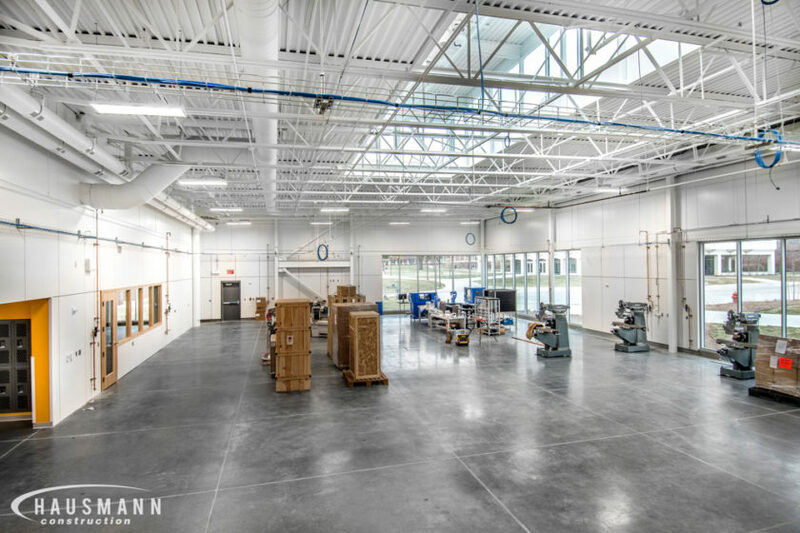 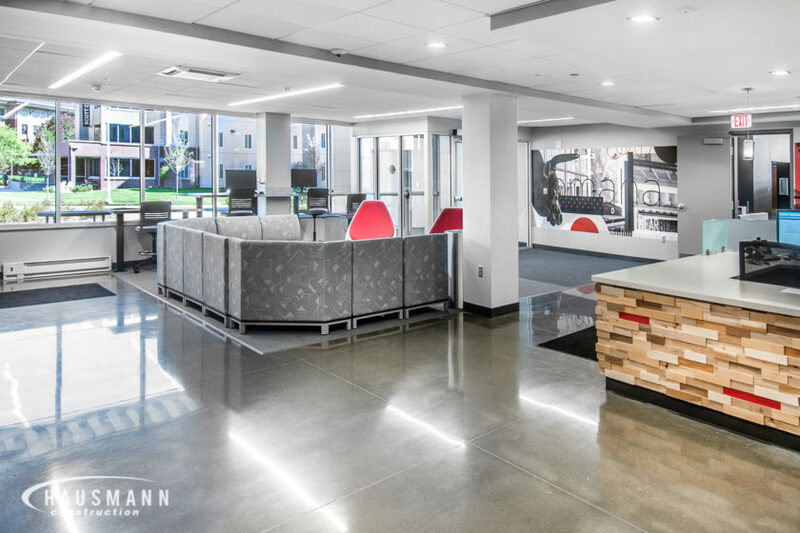 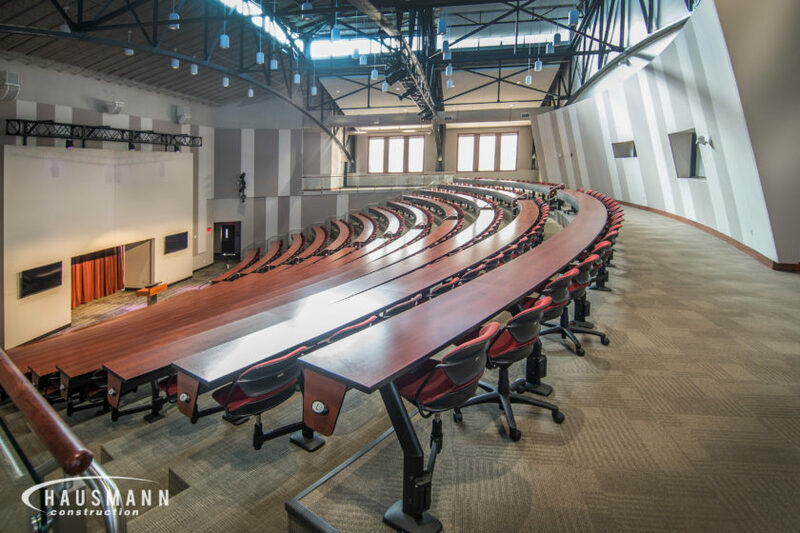 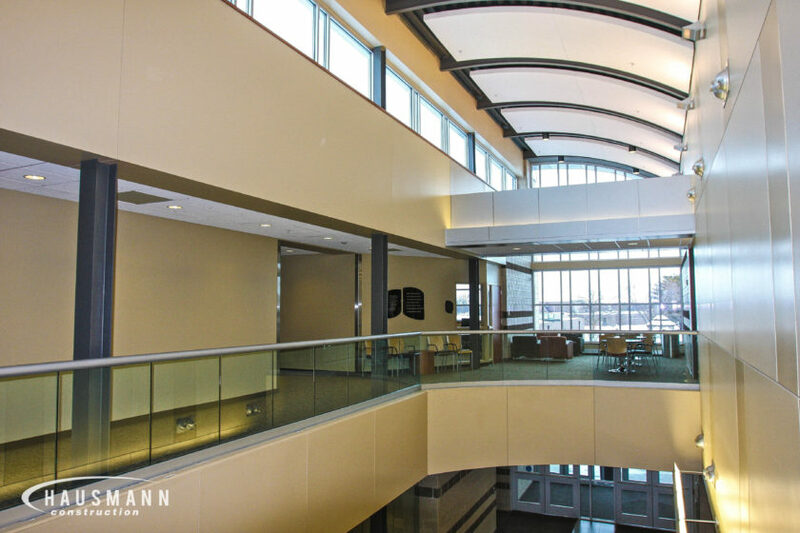 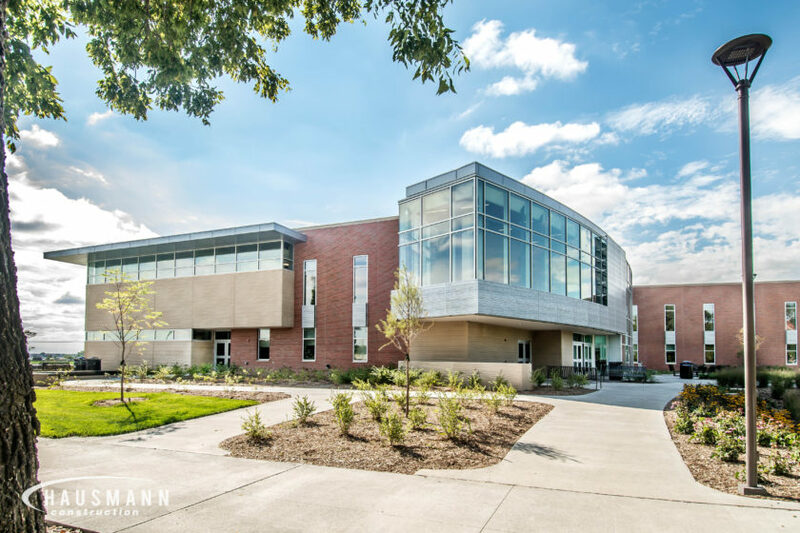 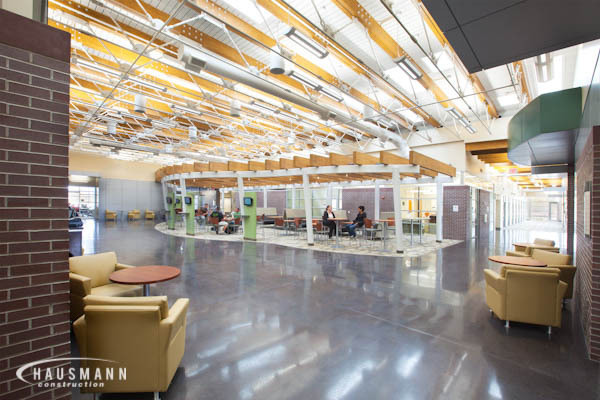 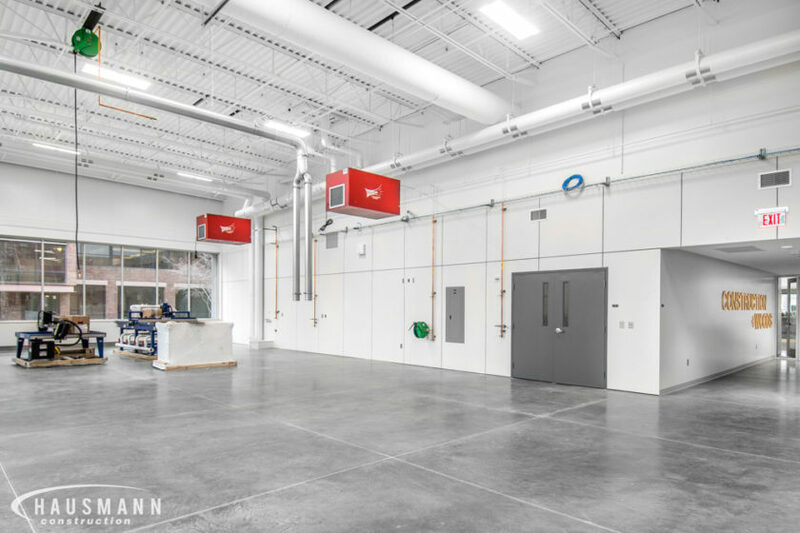 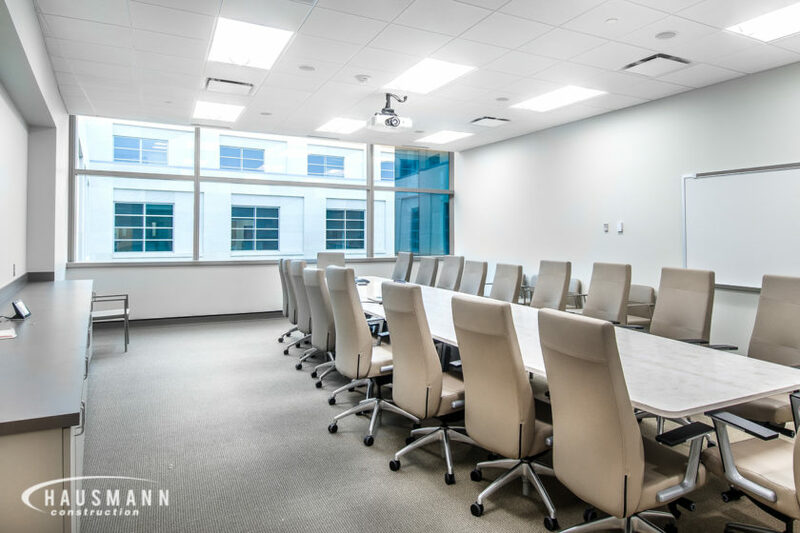 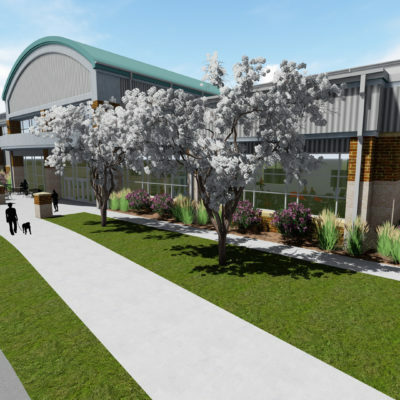 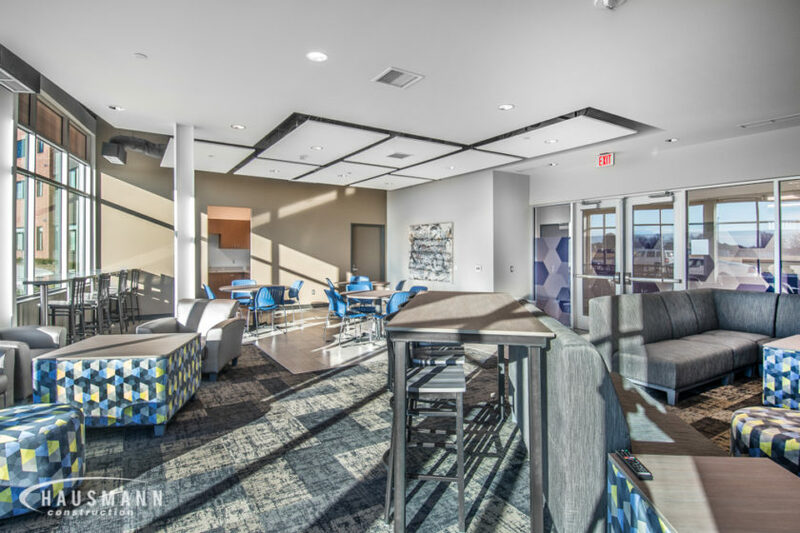 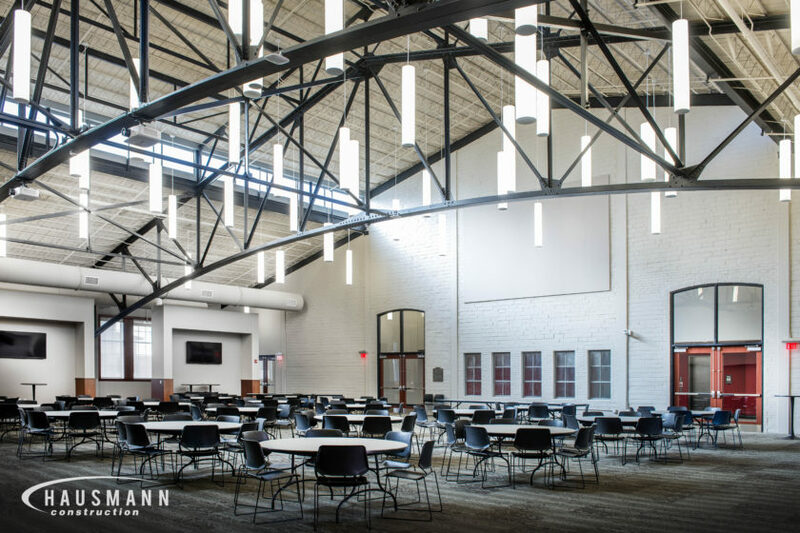 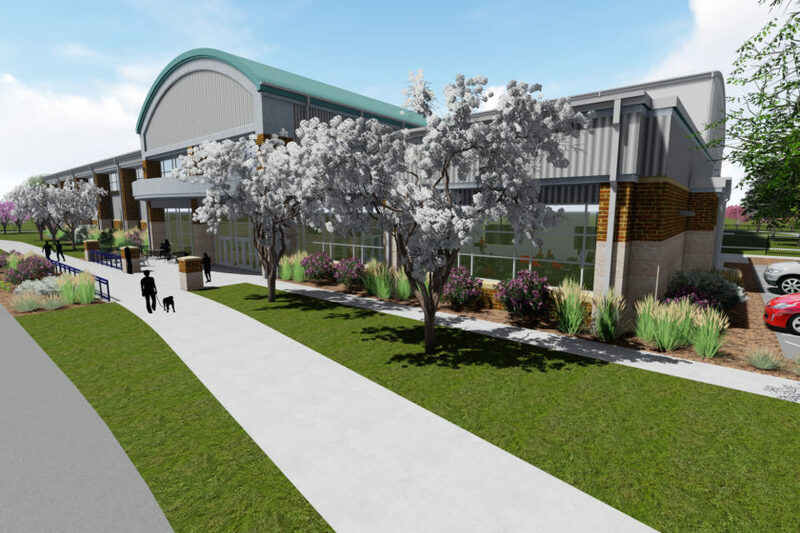 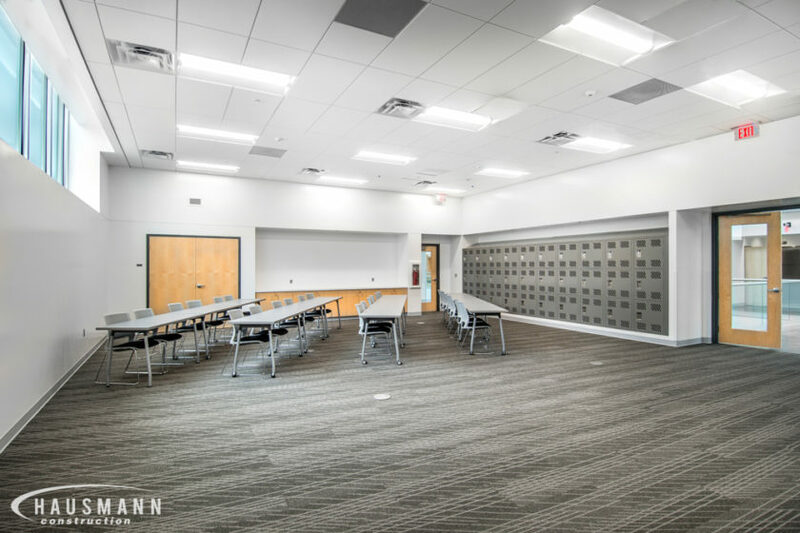 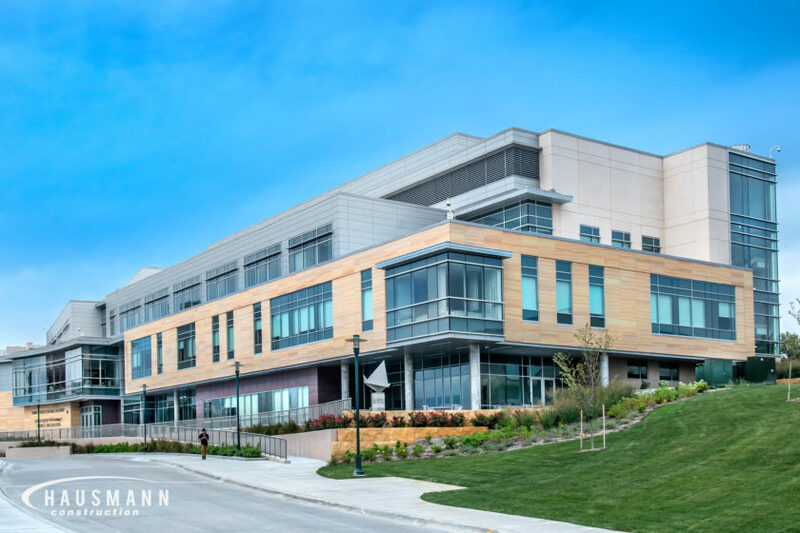 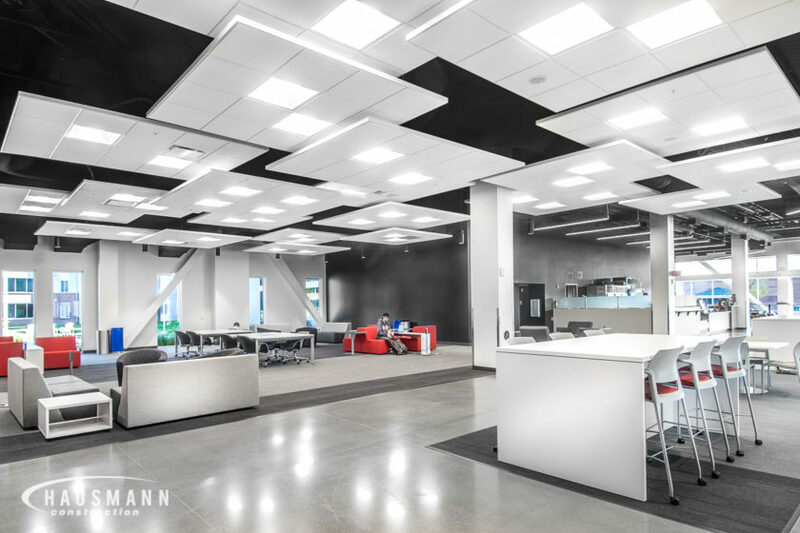 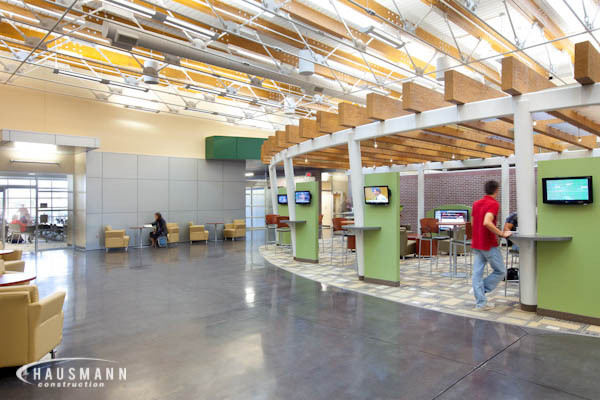 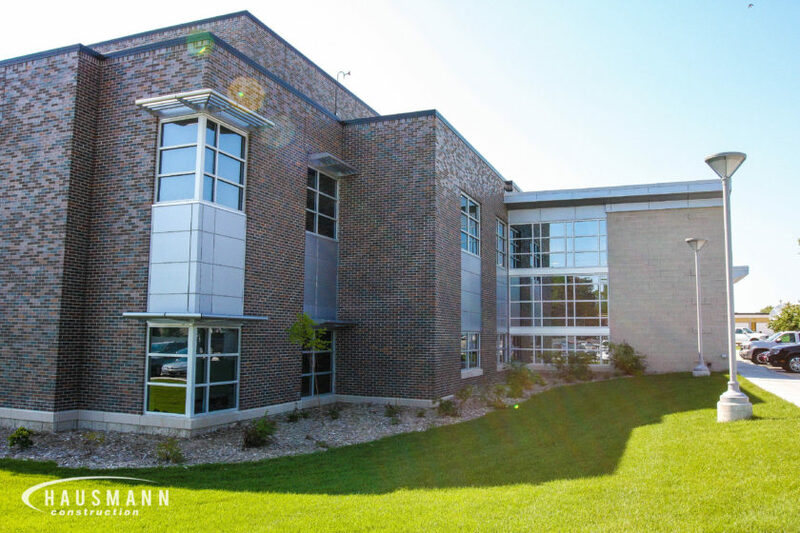 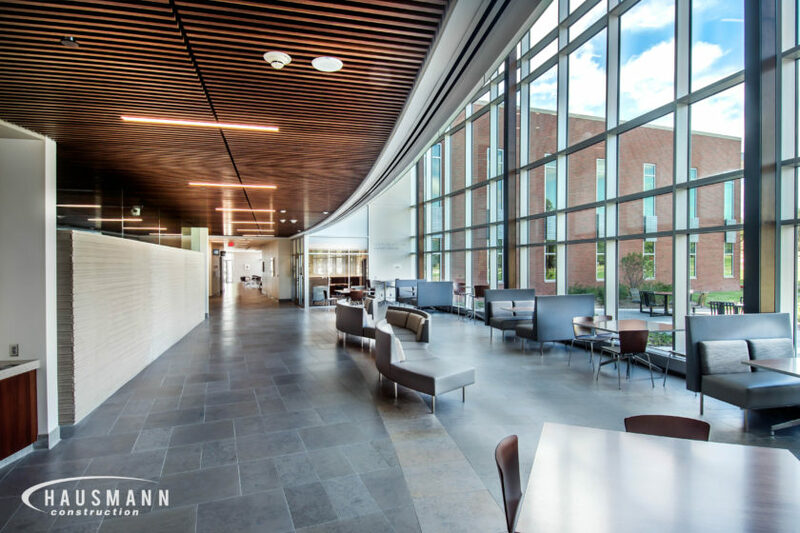 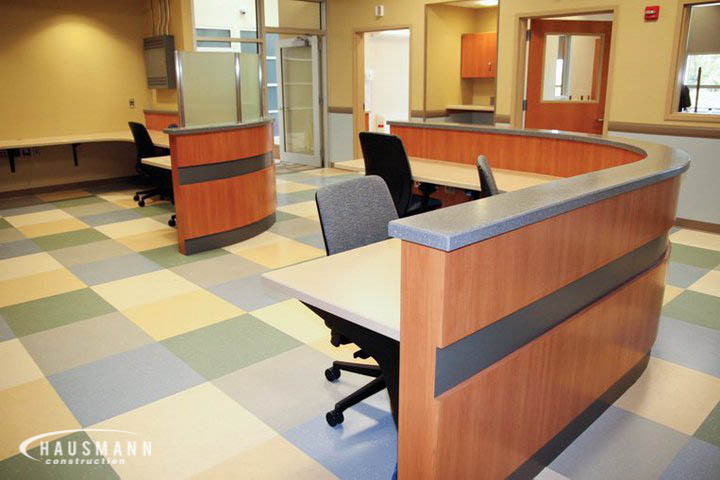 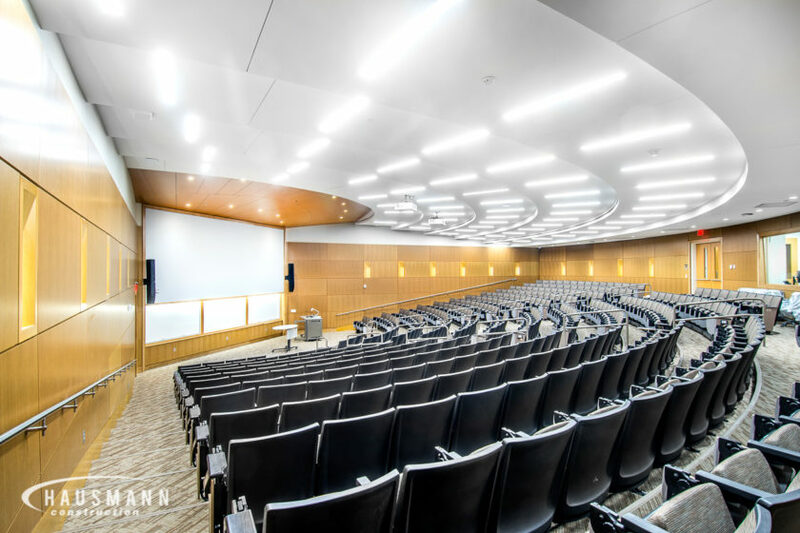 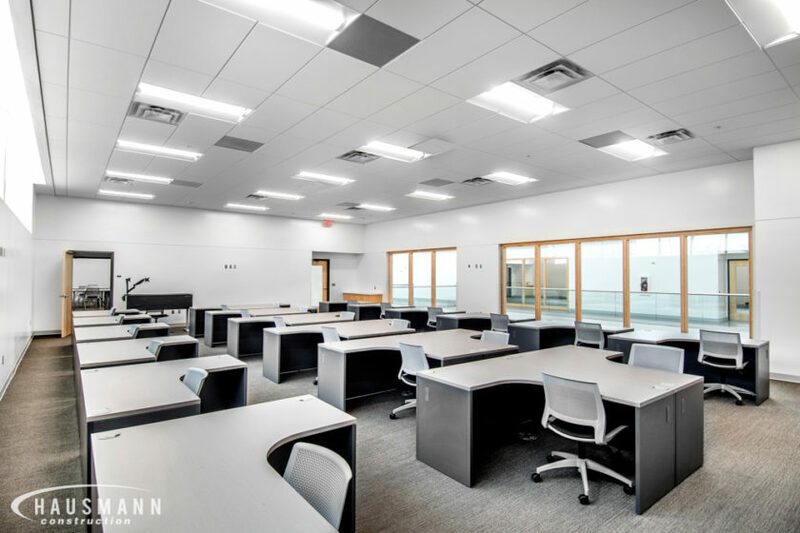 Hausmann Construction acted as the general contractor but assisted the architect with the budget and preliminary cost estimates during the design phase helping the project to be delivered under budget. 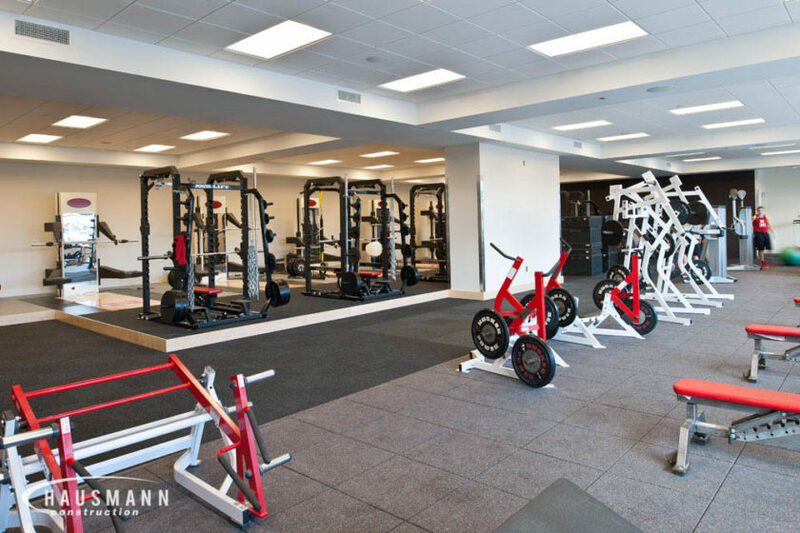 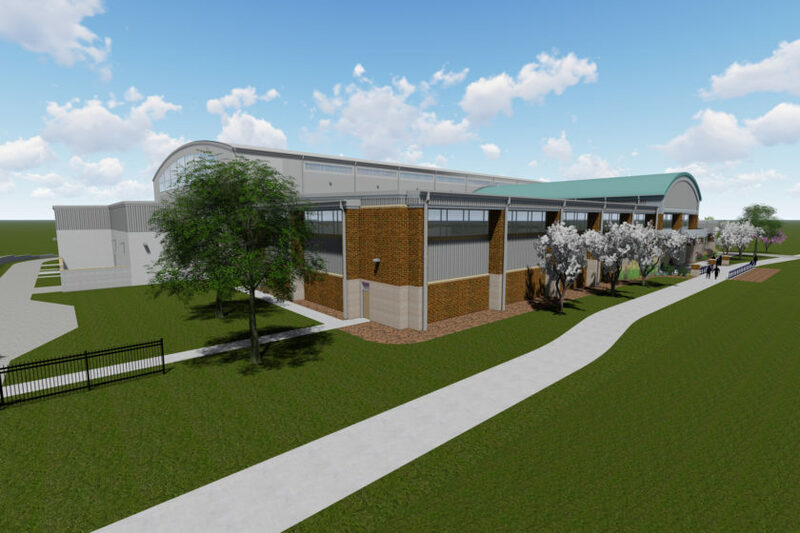 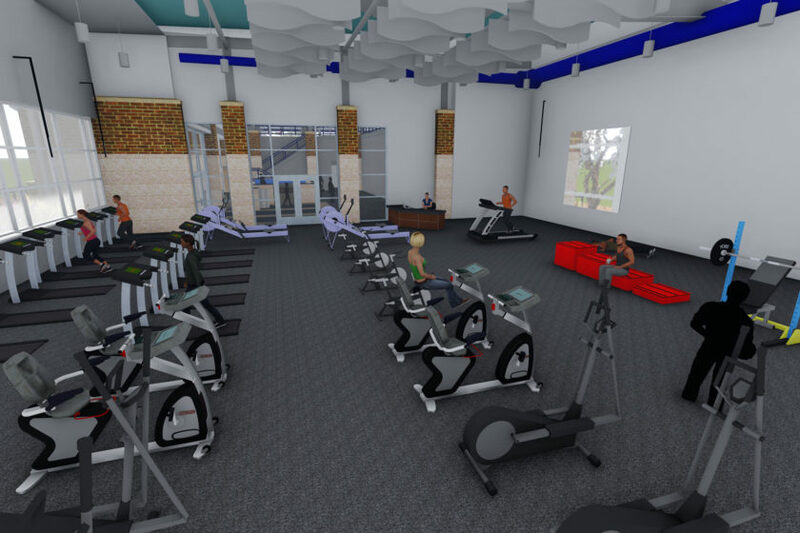 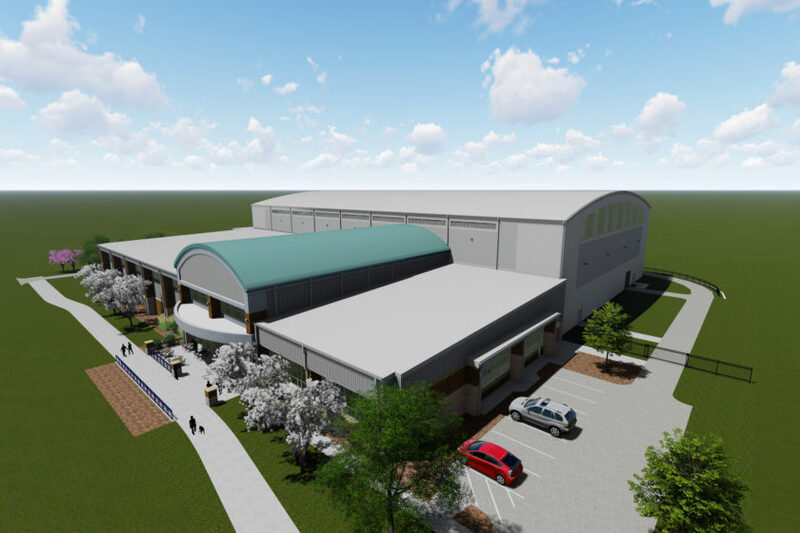 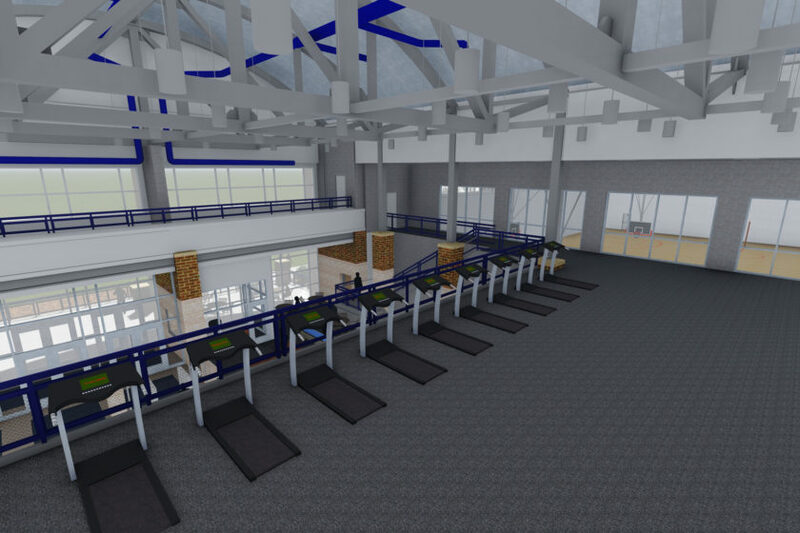 The facility contains men’s and women’s basketball courts, locker rooms and lounges as well as a wrestling/weight room and business offices. 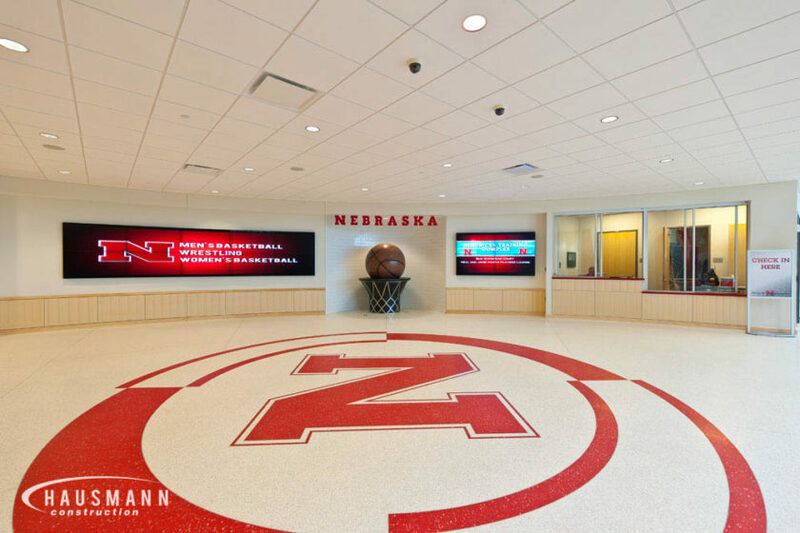 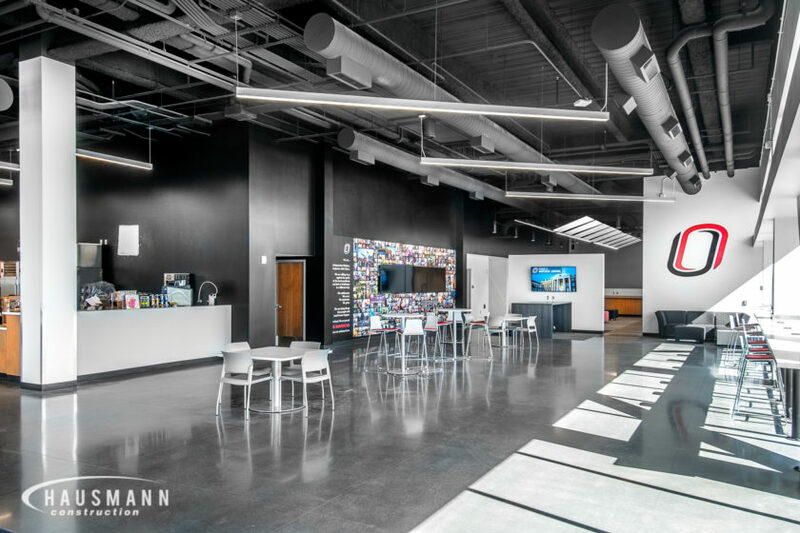 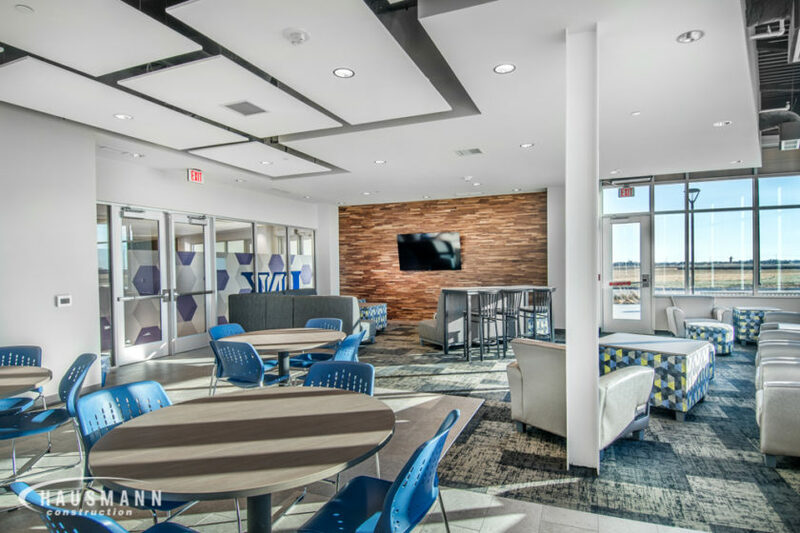 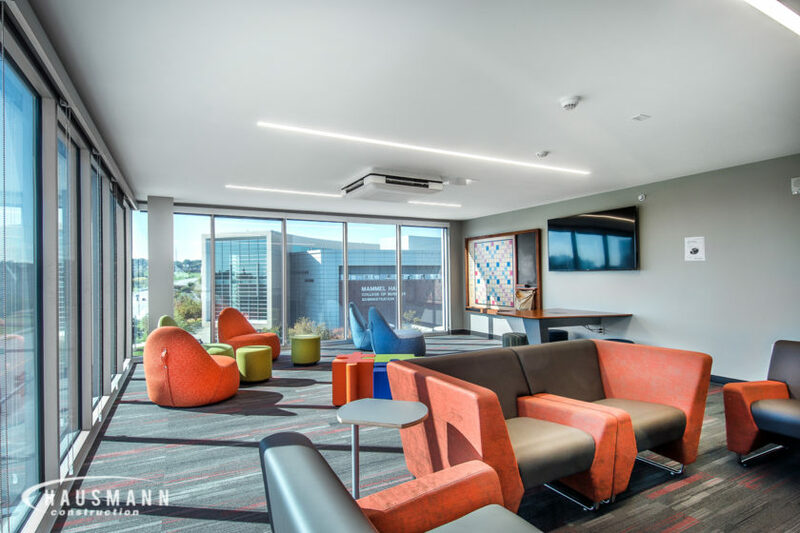 Special features include a floor to ceiling tile mural making the shape of a basketball and net, a floating granite basketball fountain and iPads which sync to individual lockers. 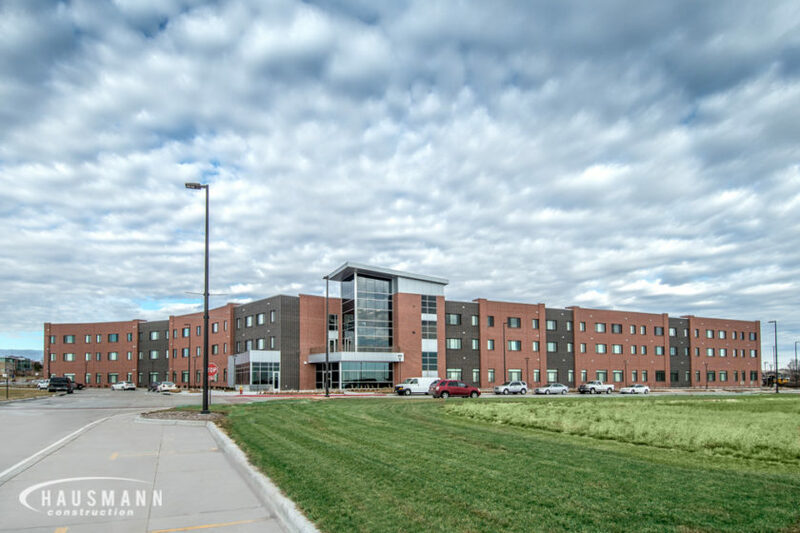 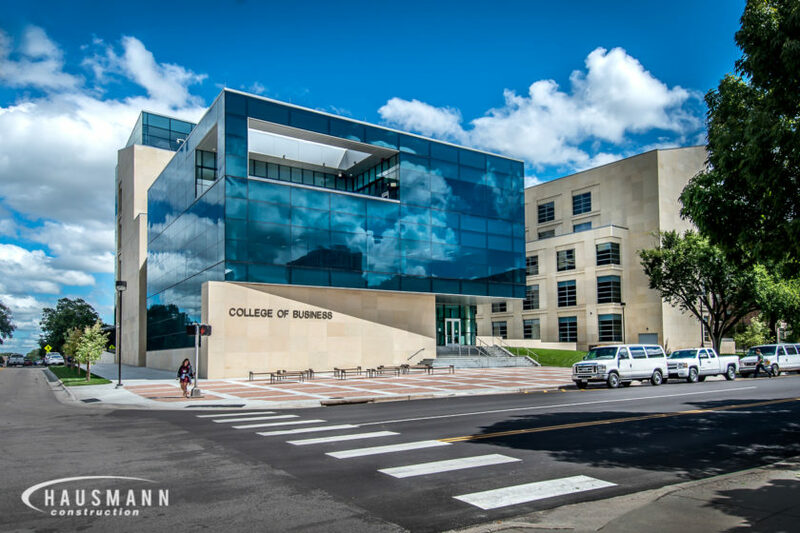 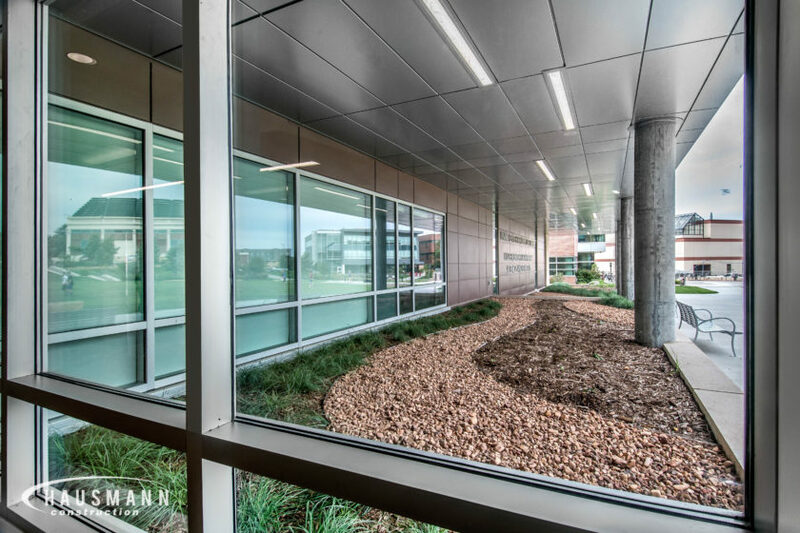 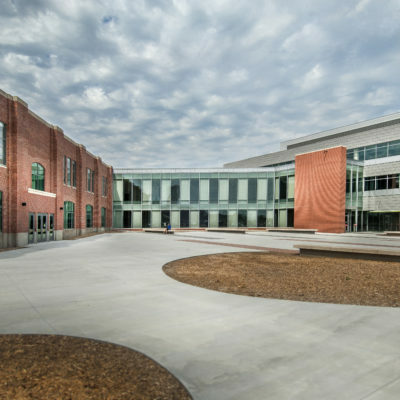 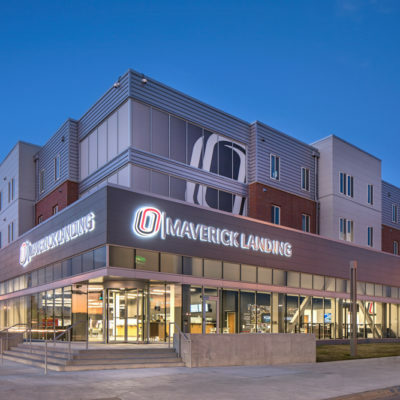 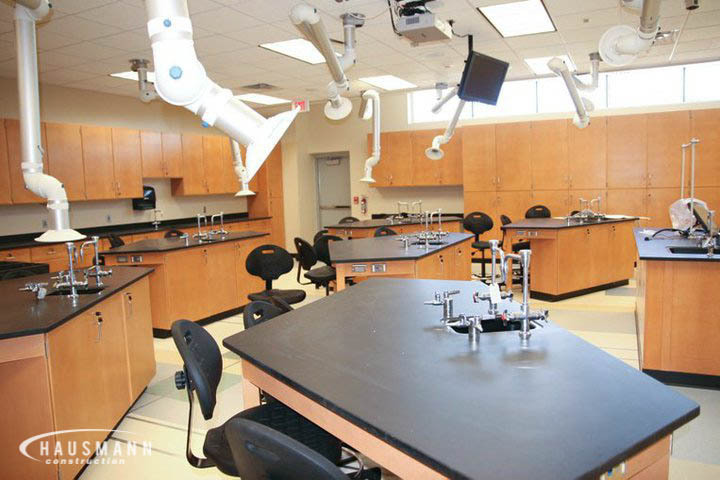 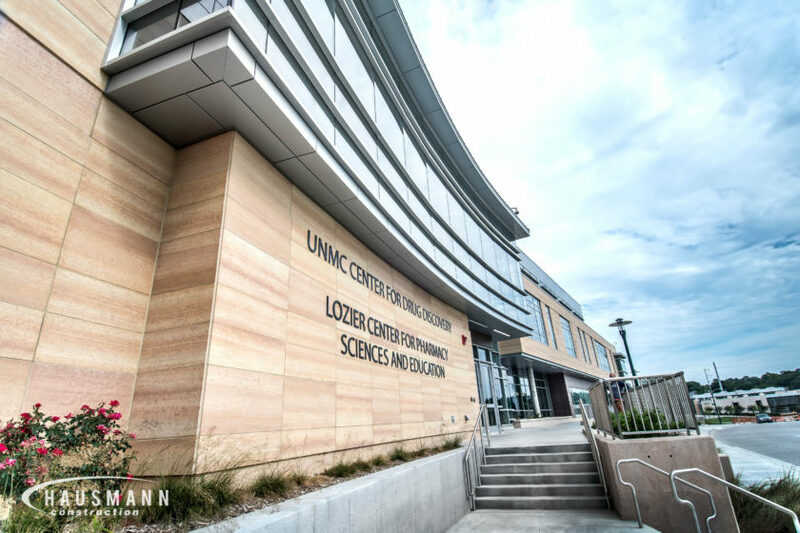 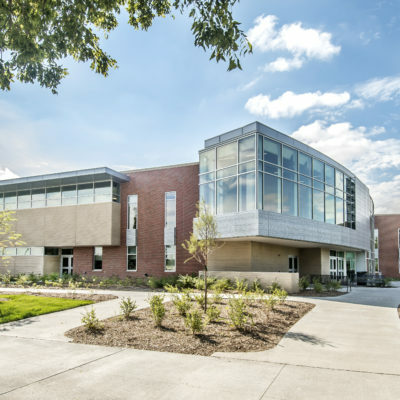 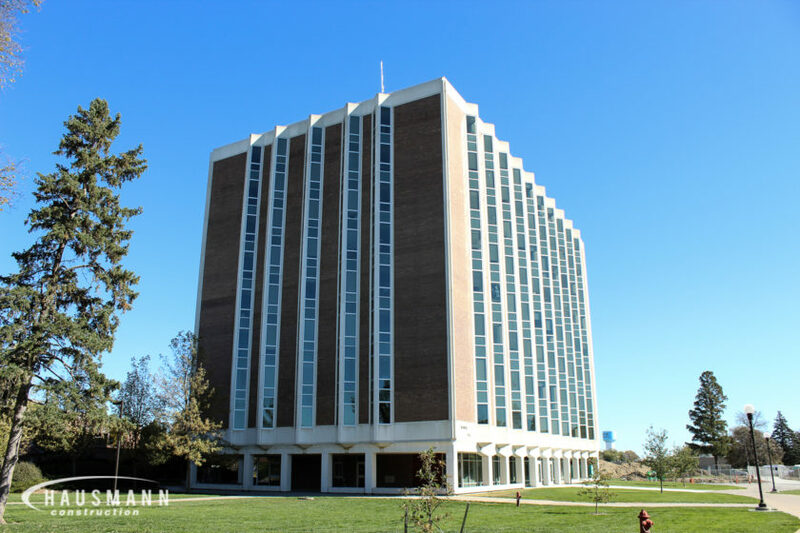 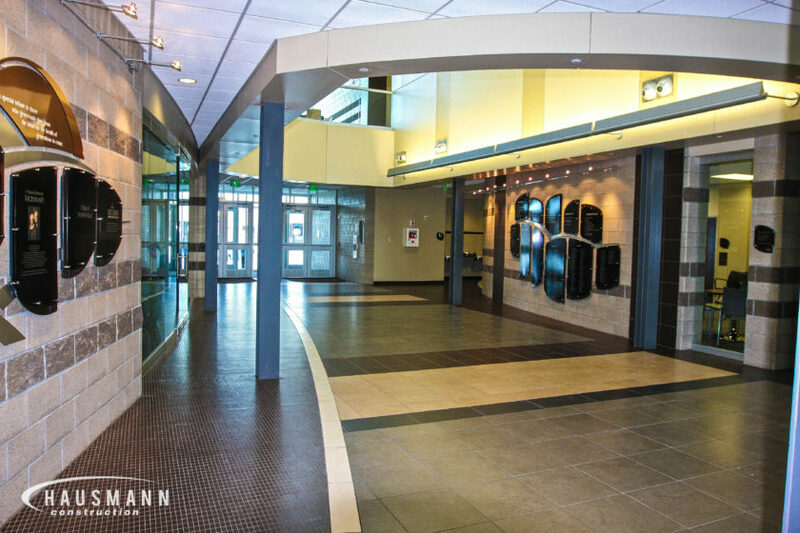 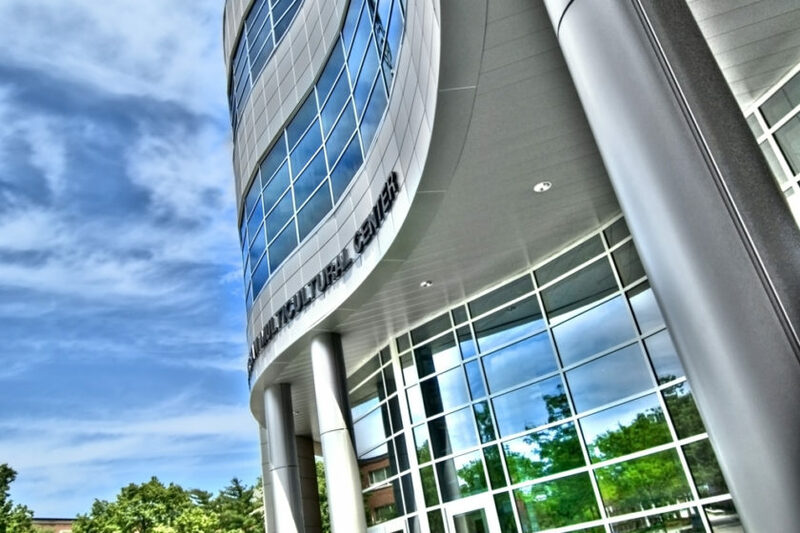 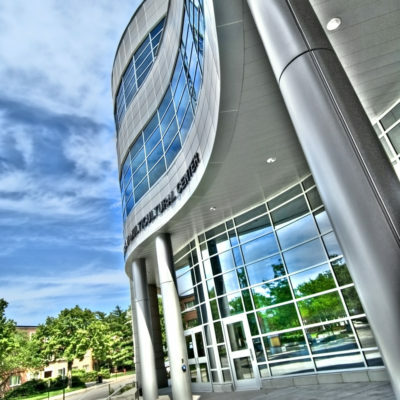 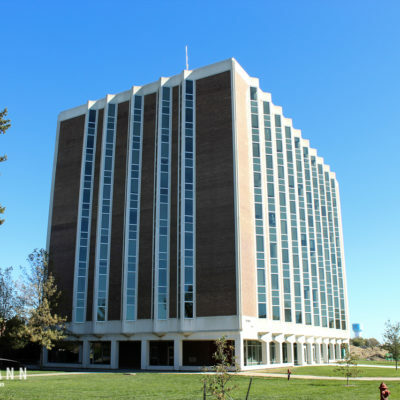 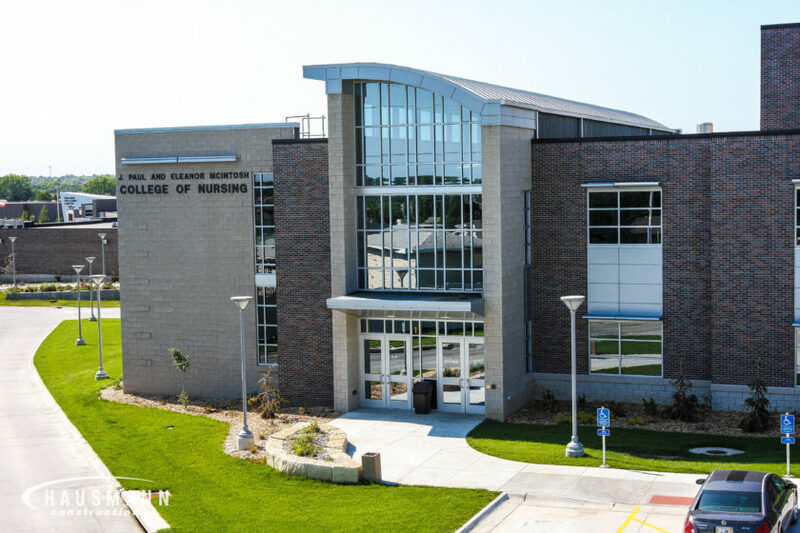 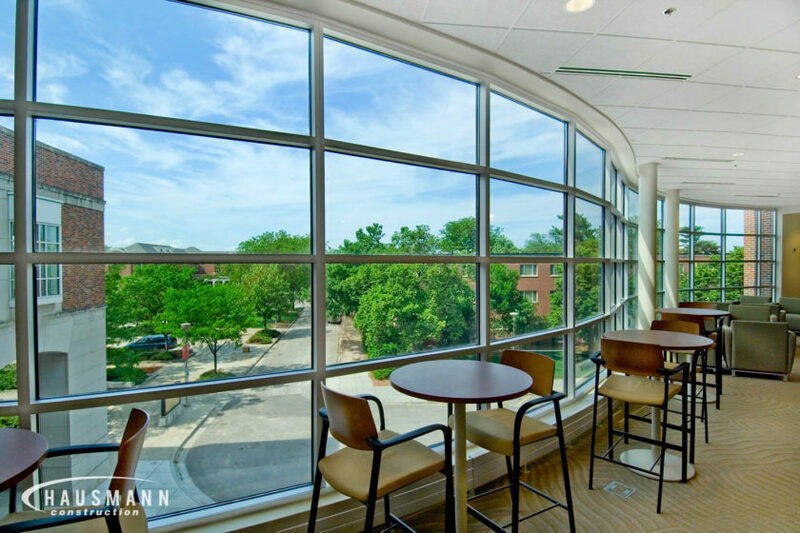 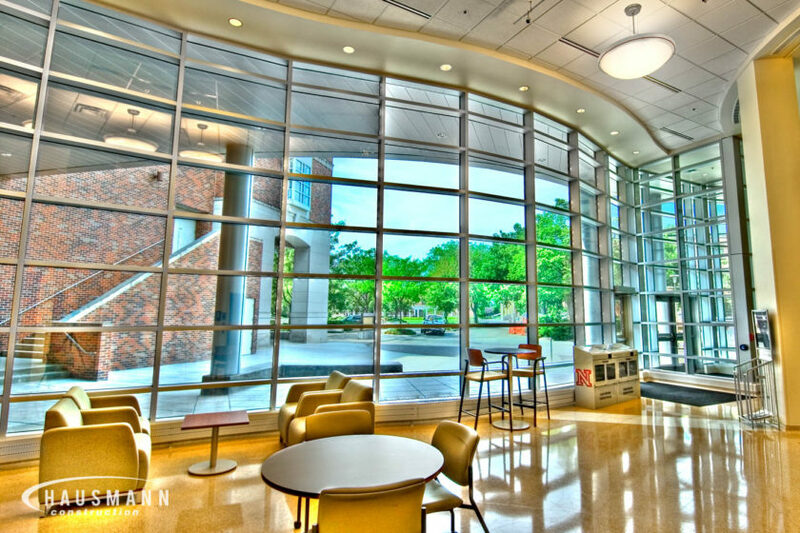 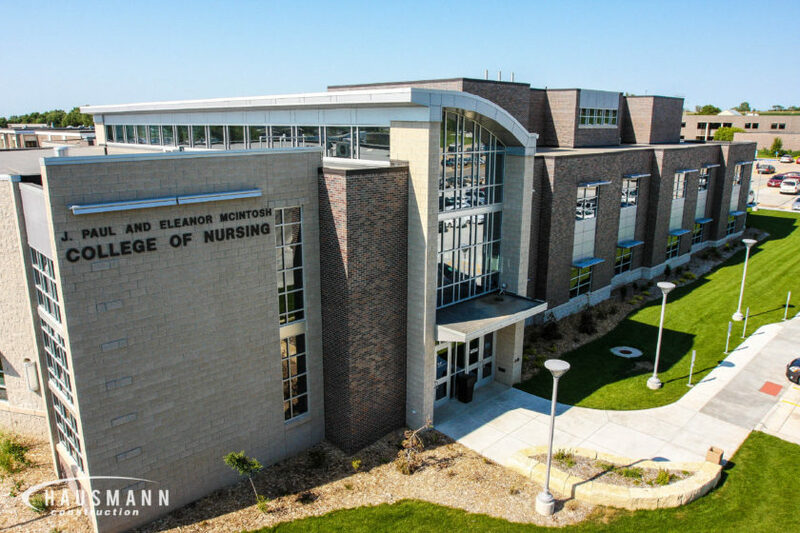 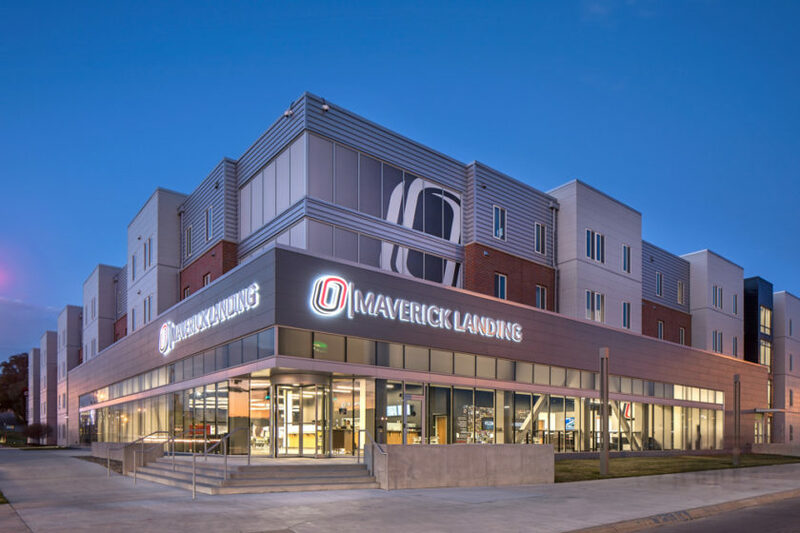 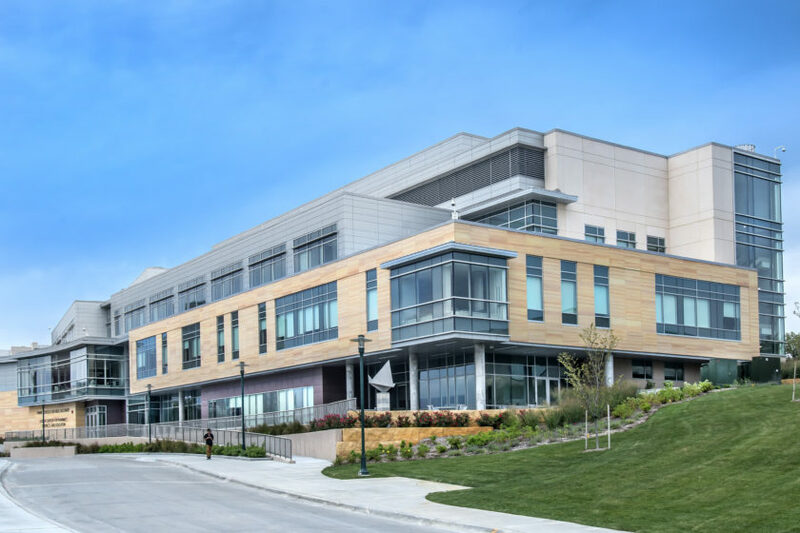 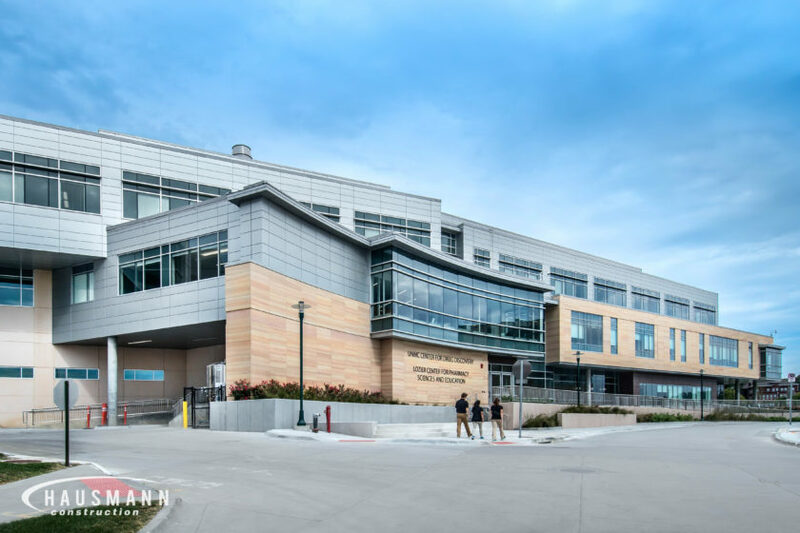 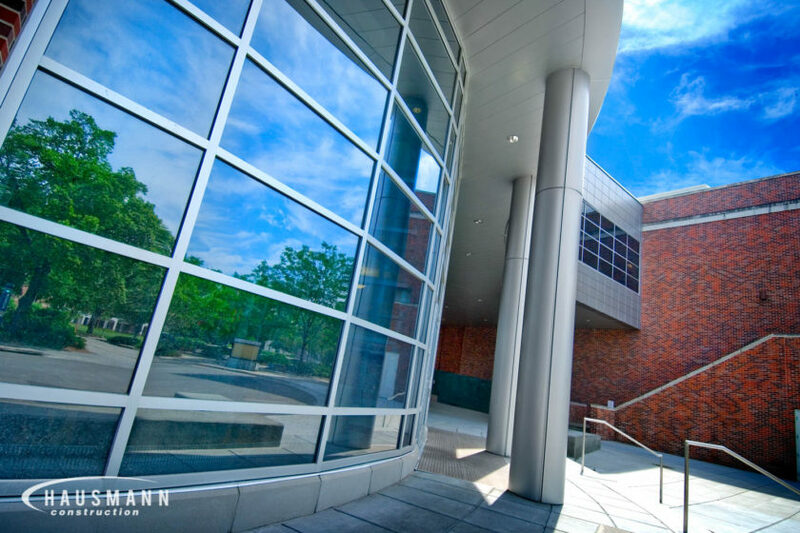 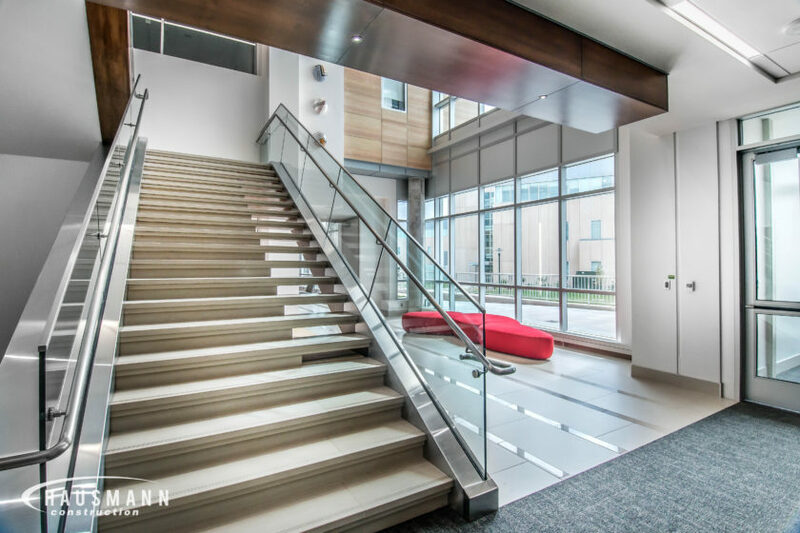 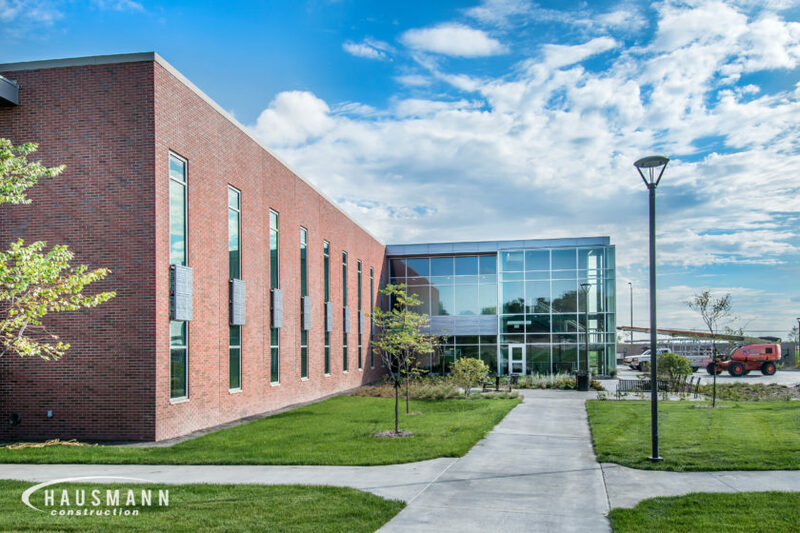 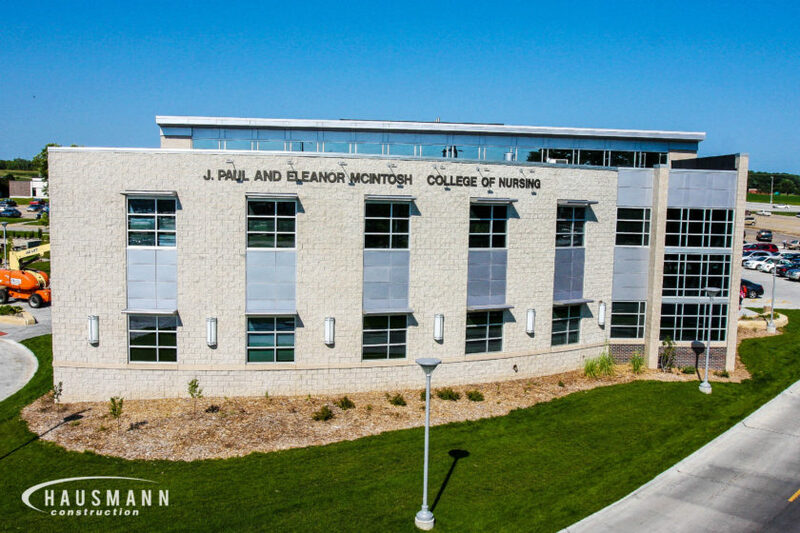 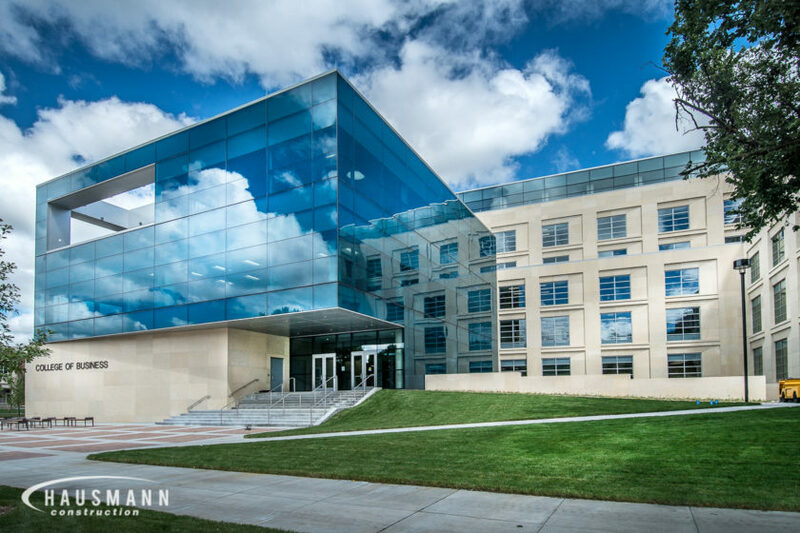 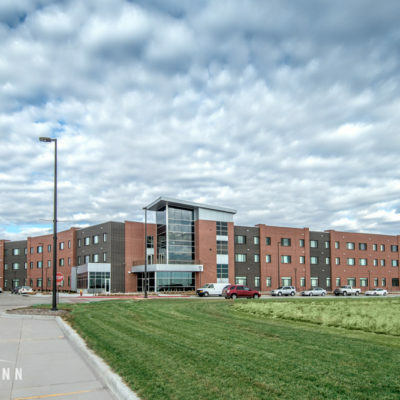 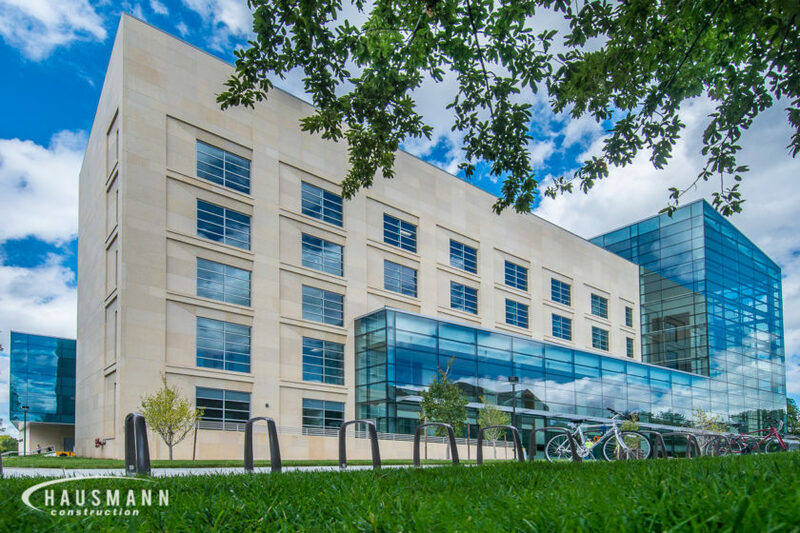 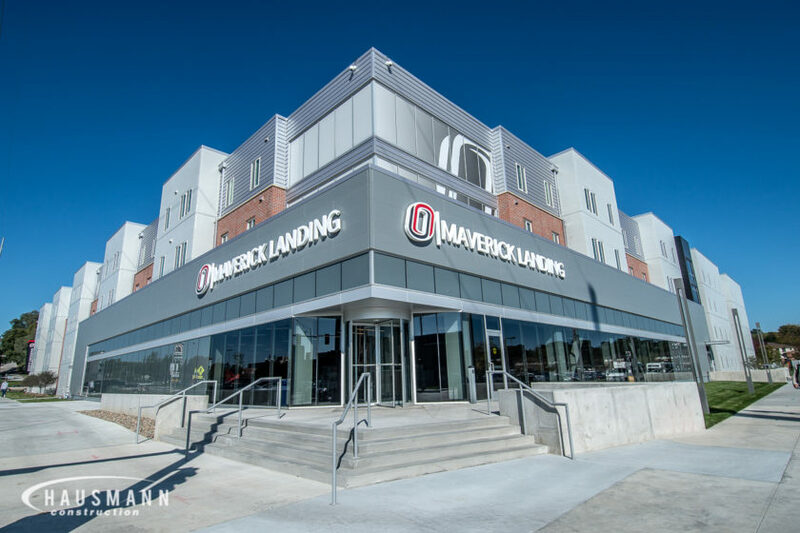 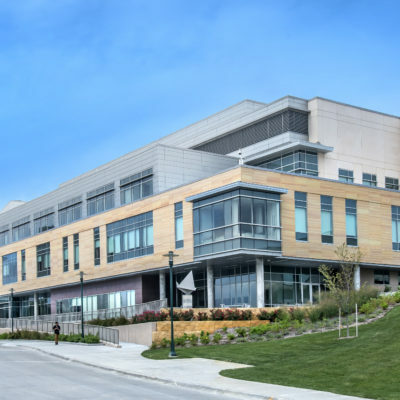 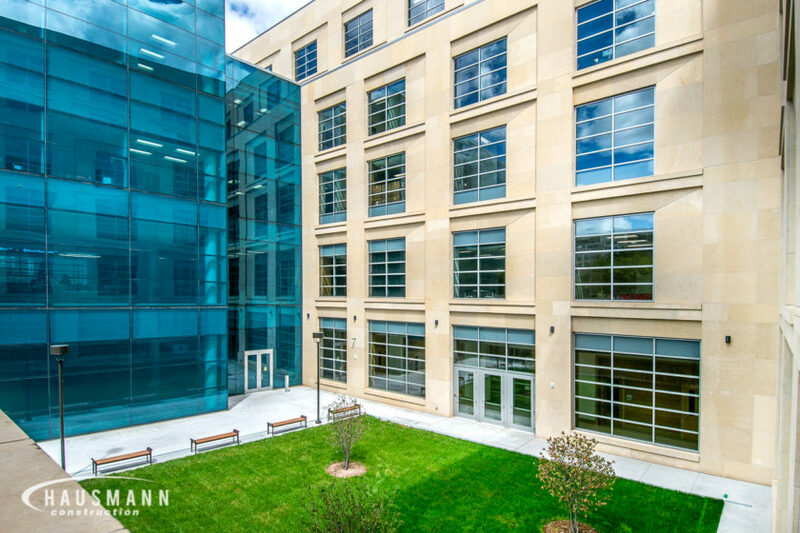 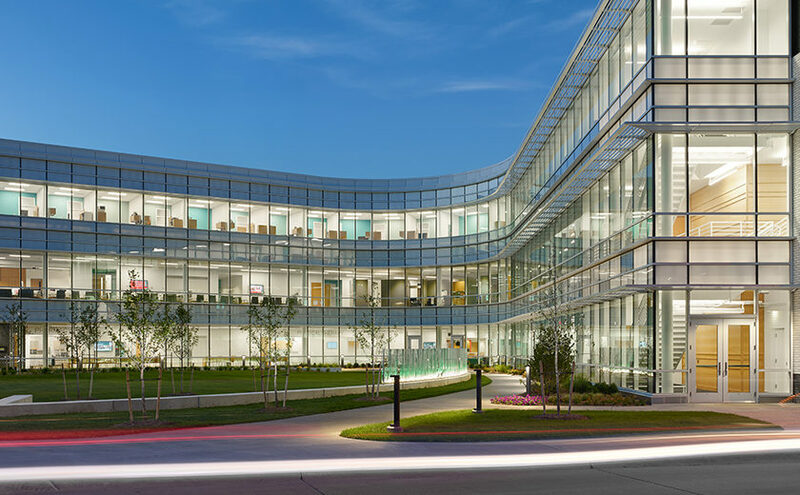 45,000 square foot LEED Silver Certified Building was constructed in the heart of the University’s downtown Lincoln campus. 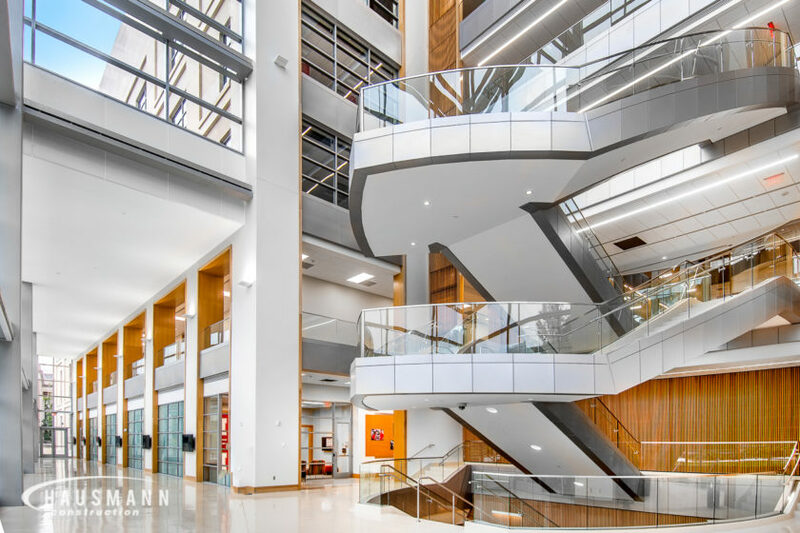 The project has immaculate store-front windows that wrap around the building and a four-story spiral staircase in the entry. 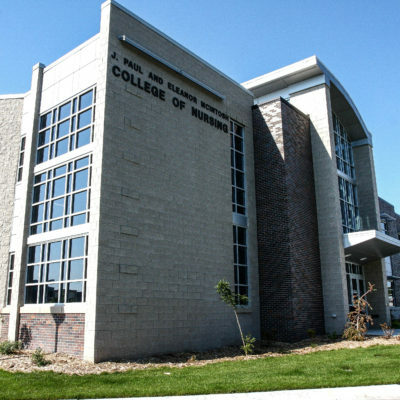 The building also has offices, meeting and conference rooms, a music room, kitchen and computer lab.